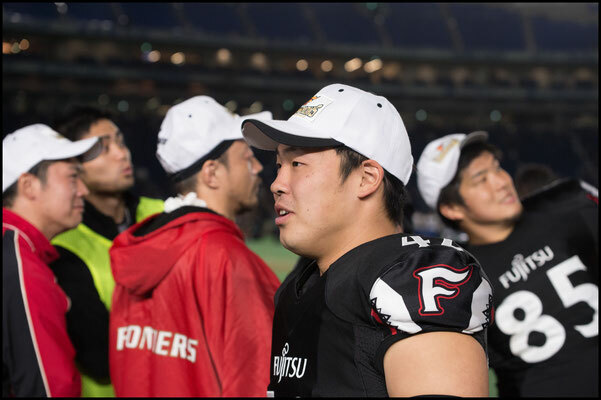 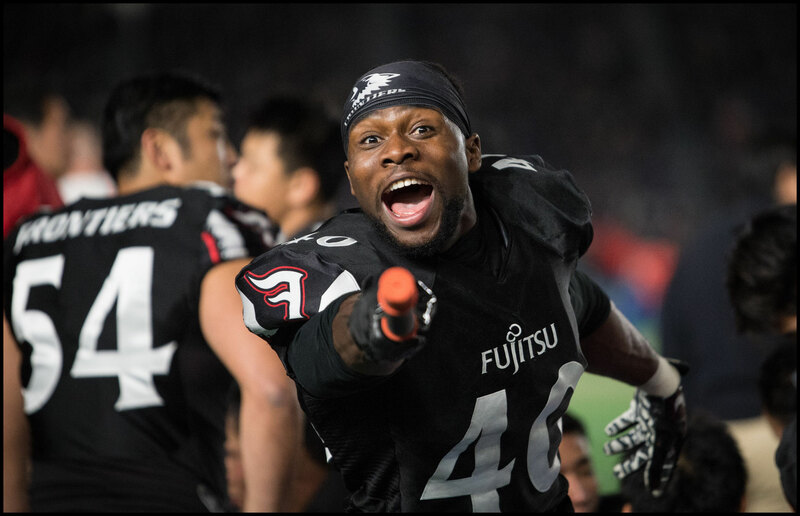 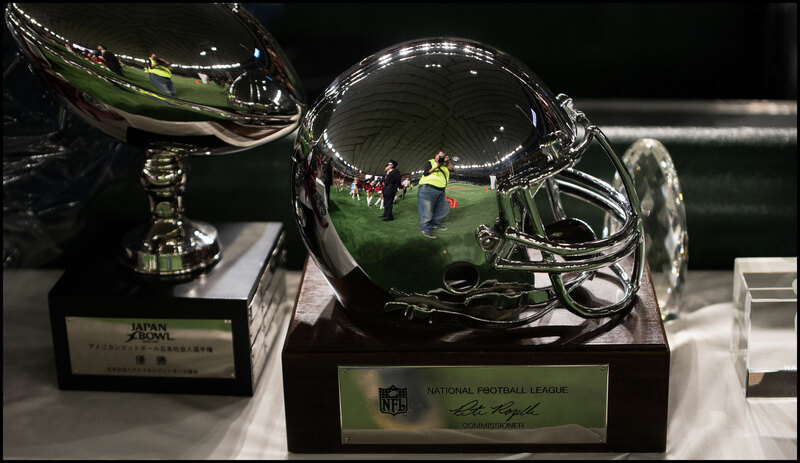 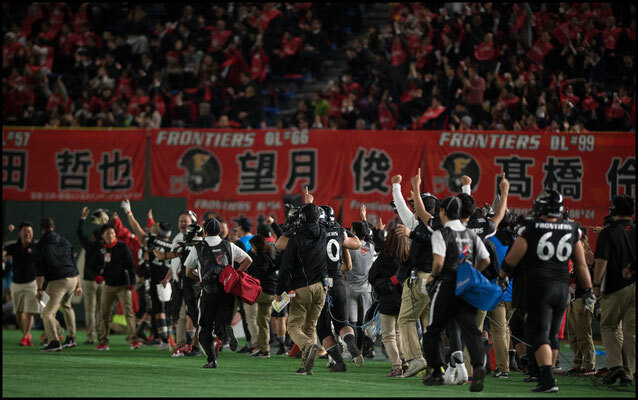 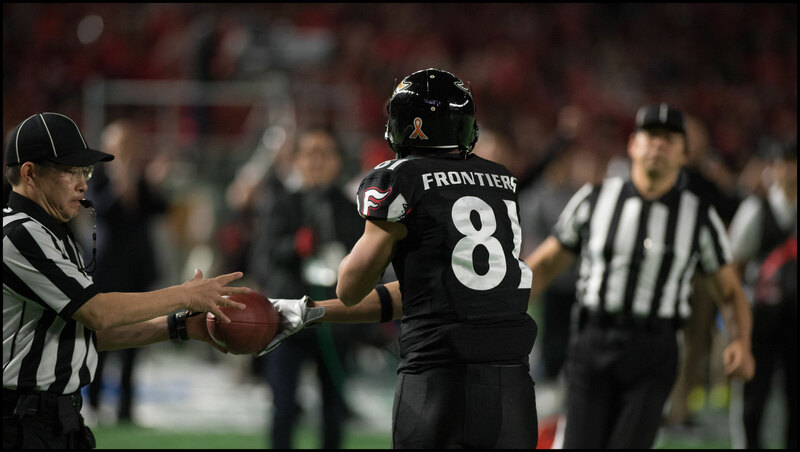 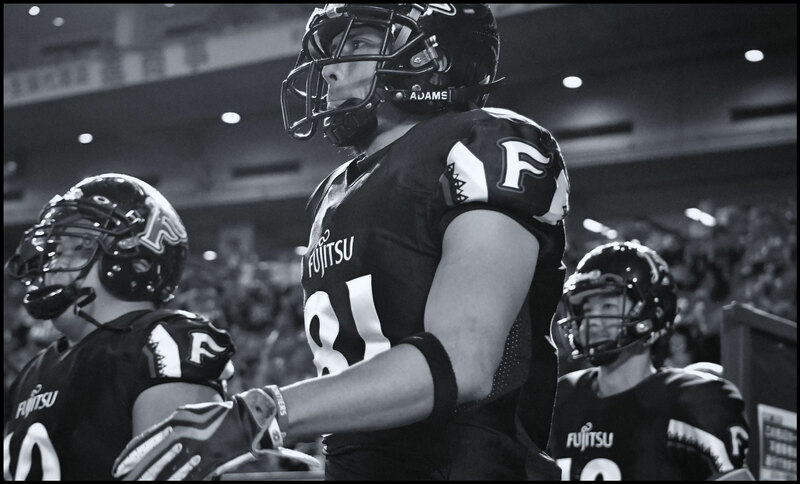 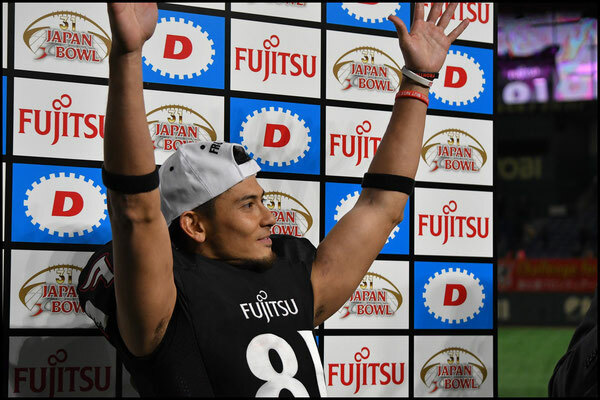 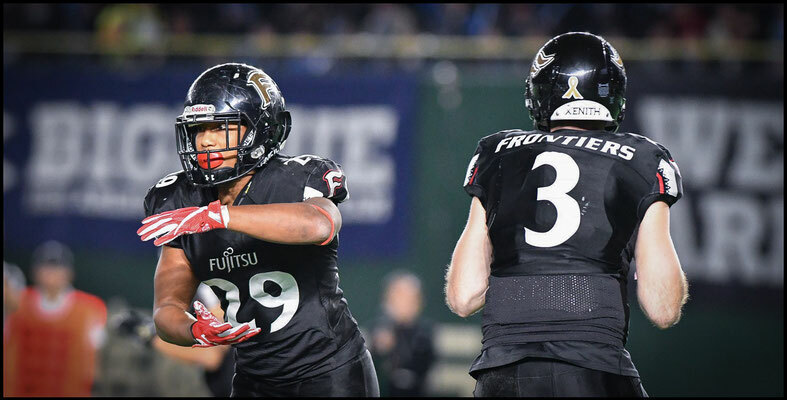 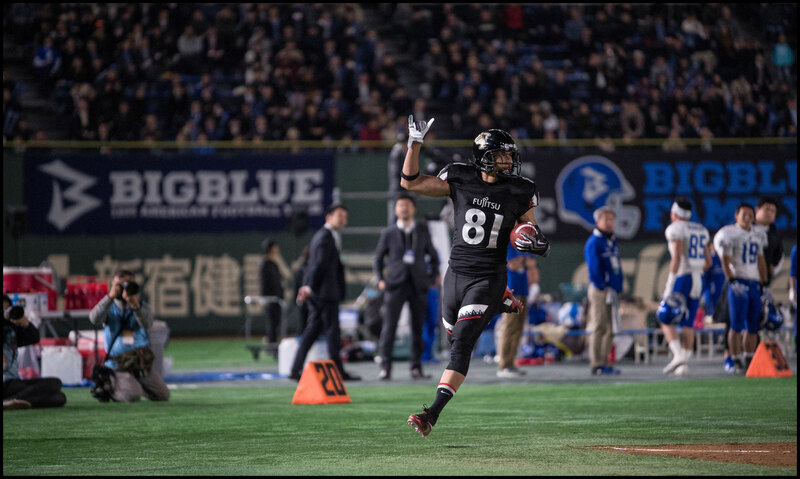 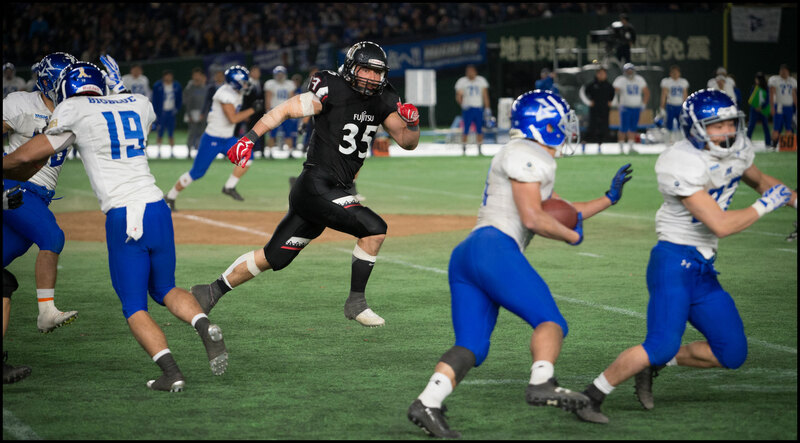 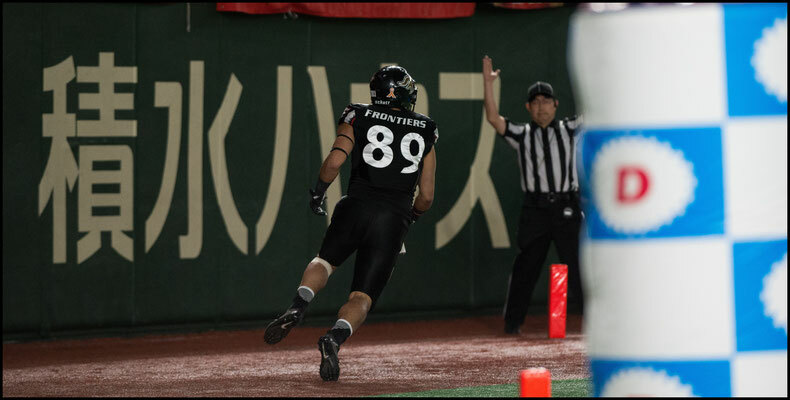 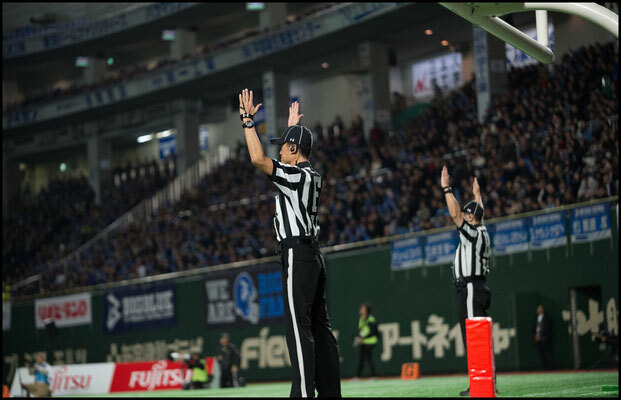 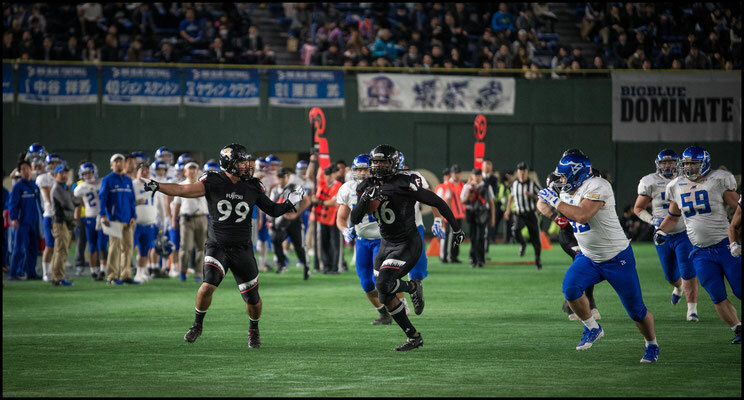 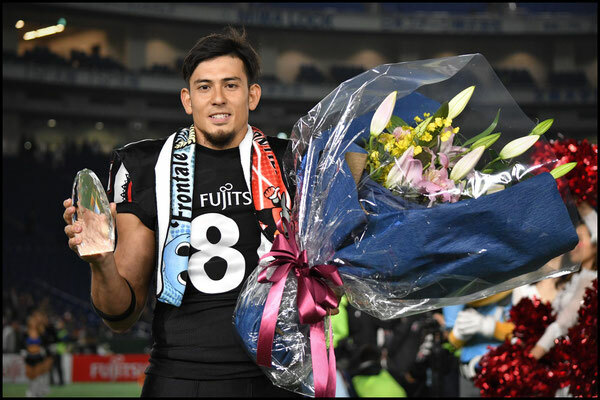 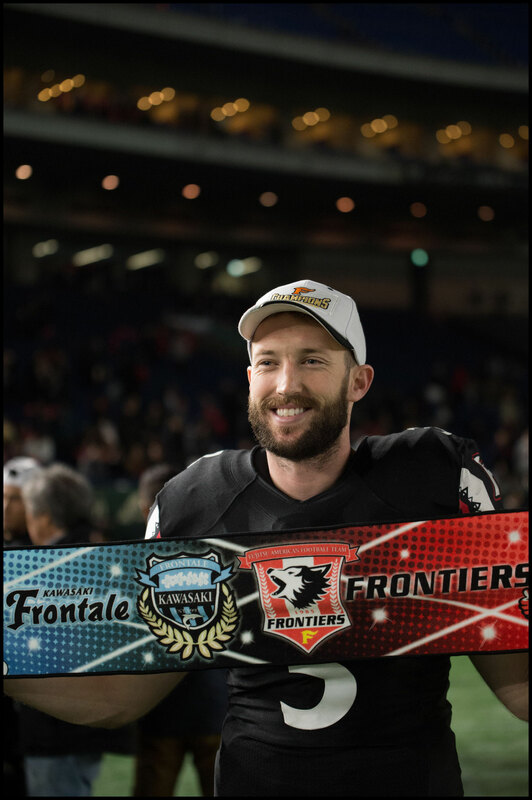 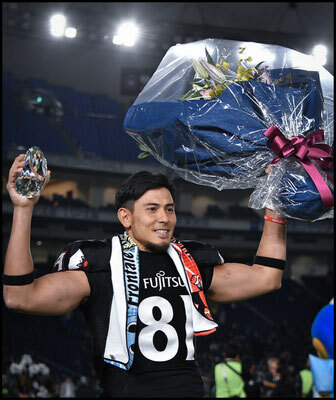 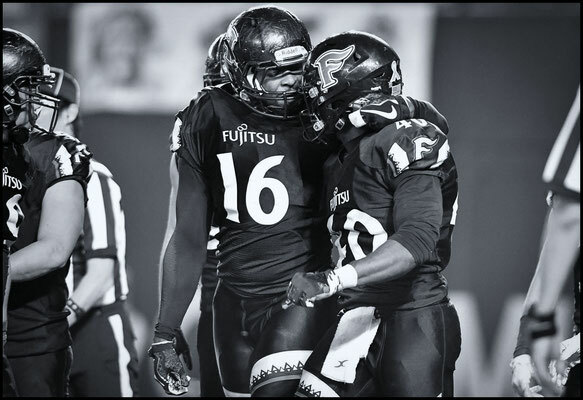 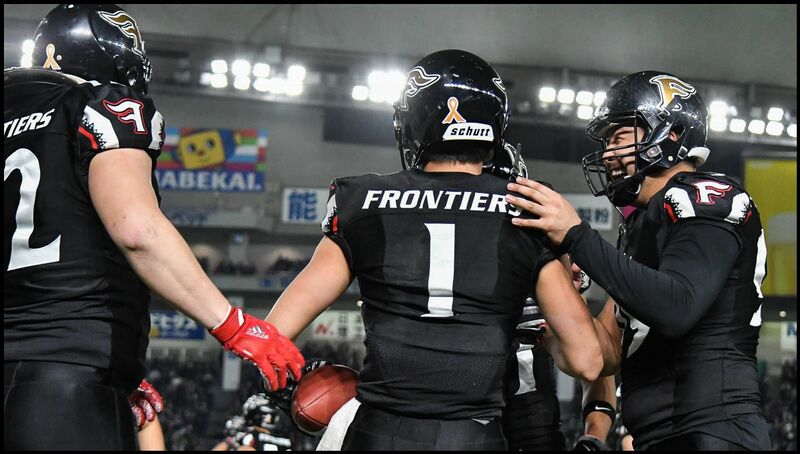 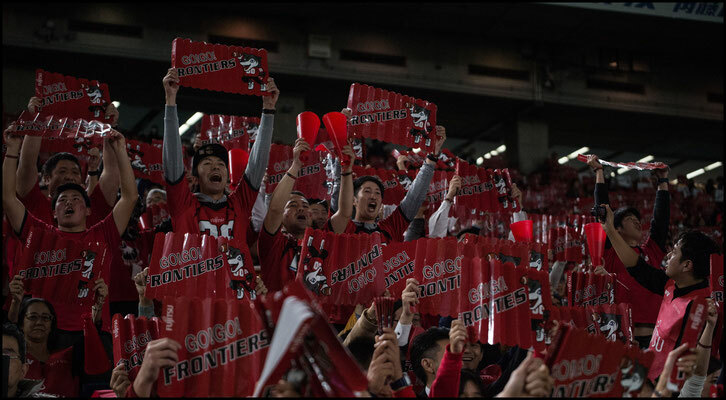 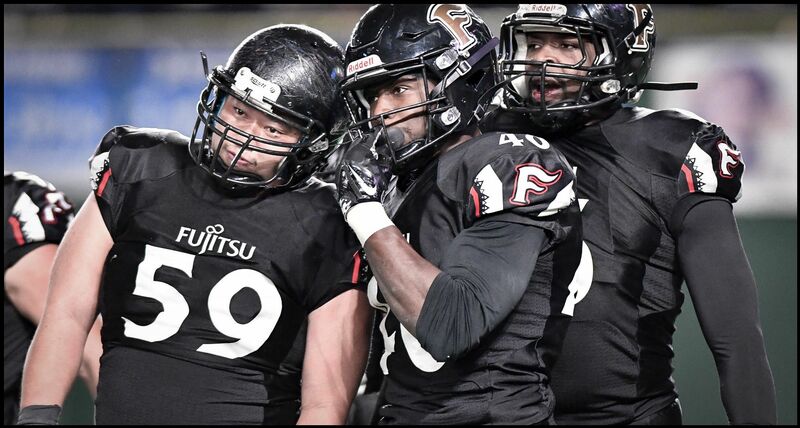 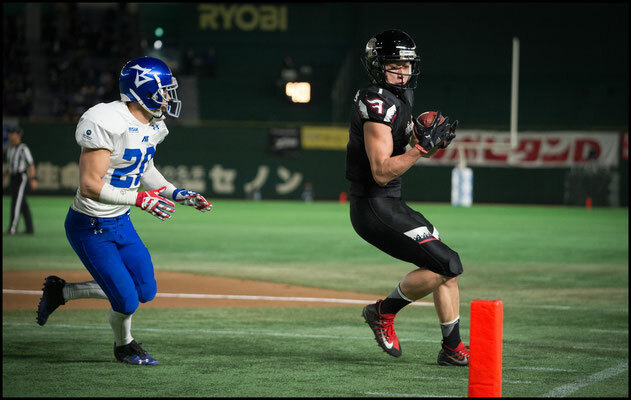 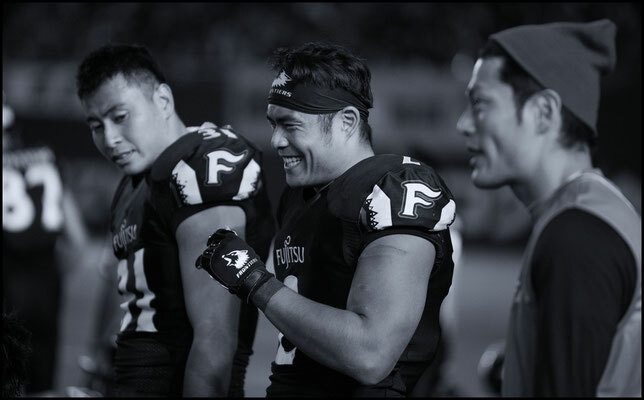 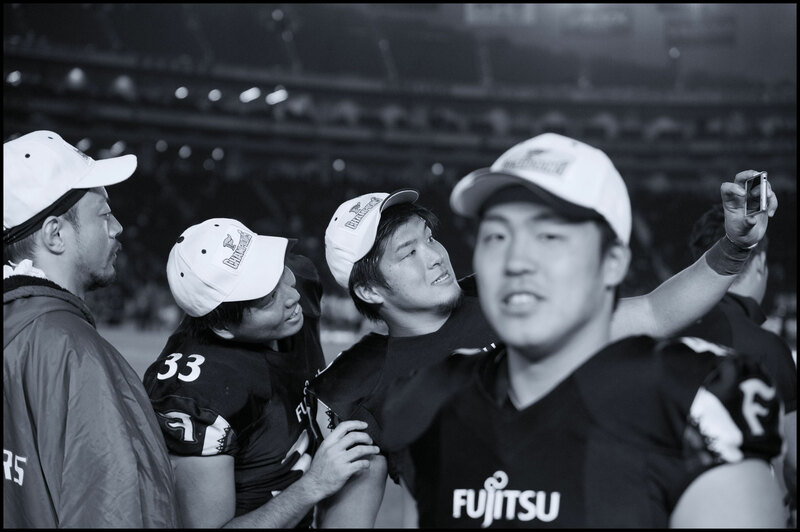 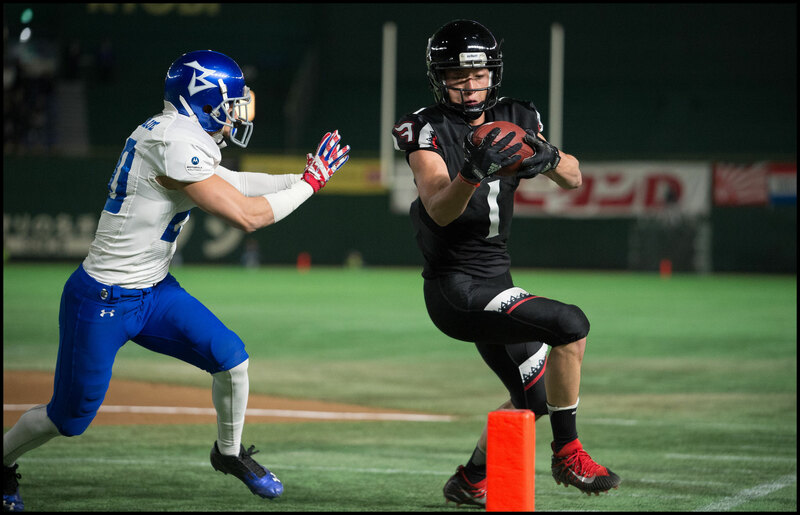 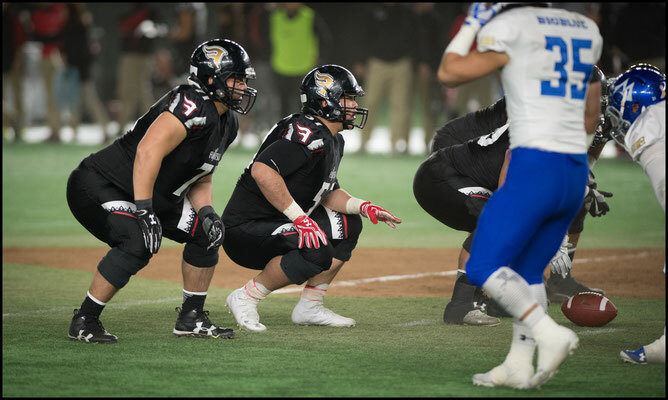 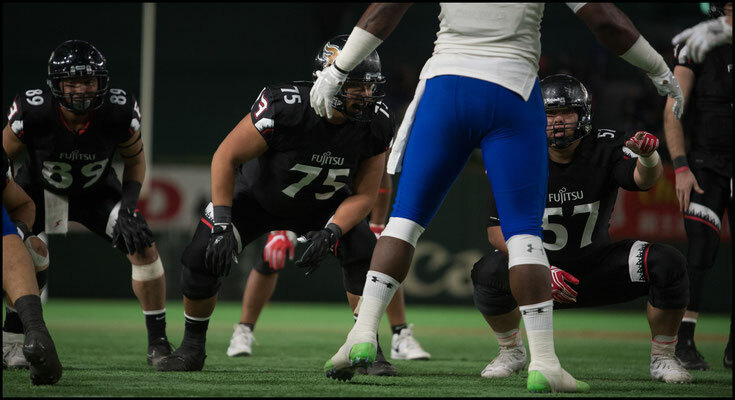 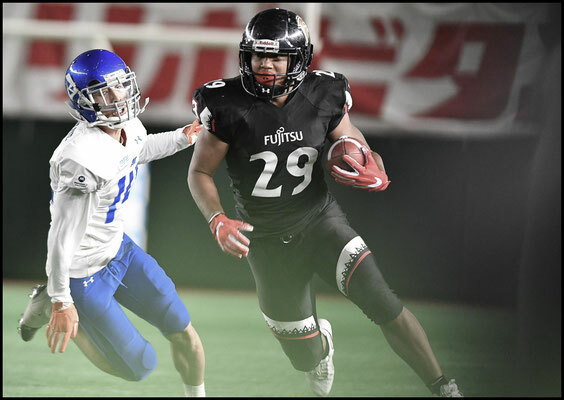 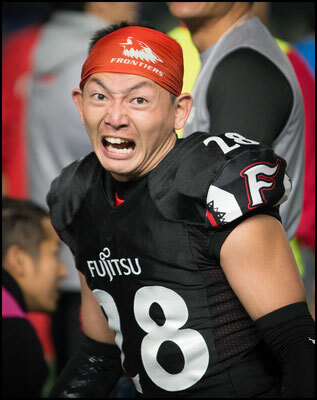 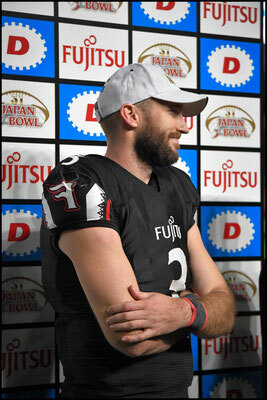 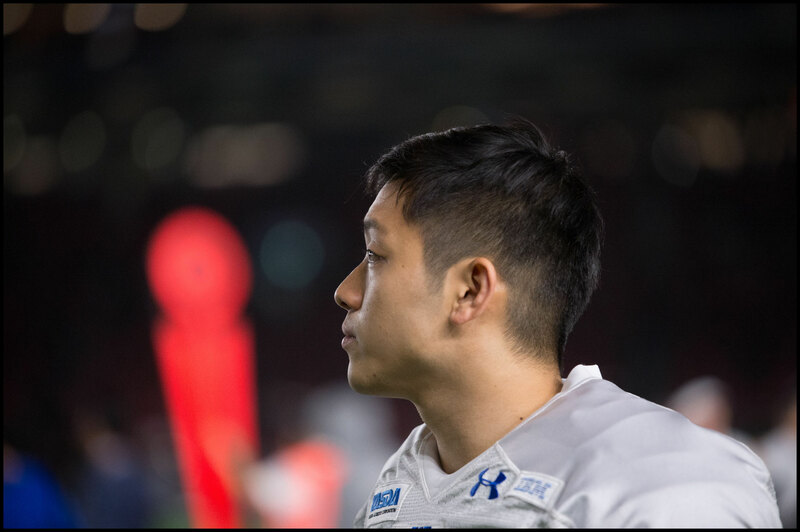 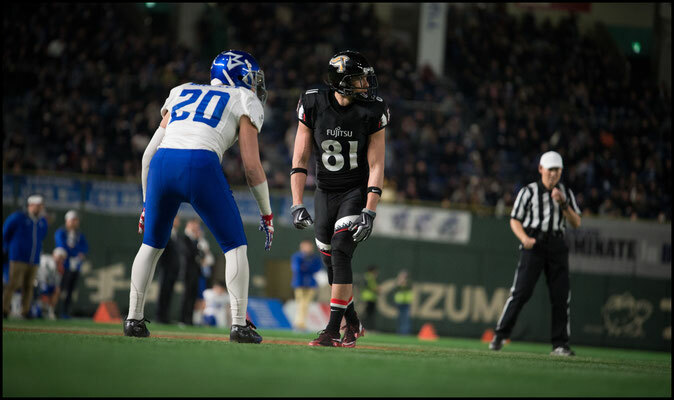 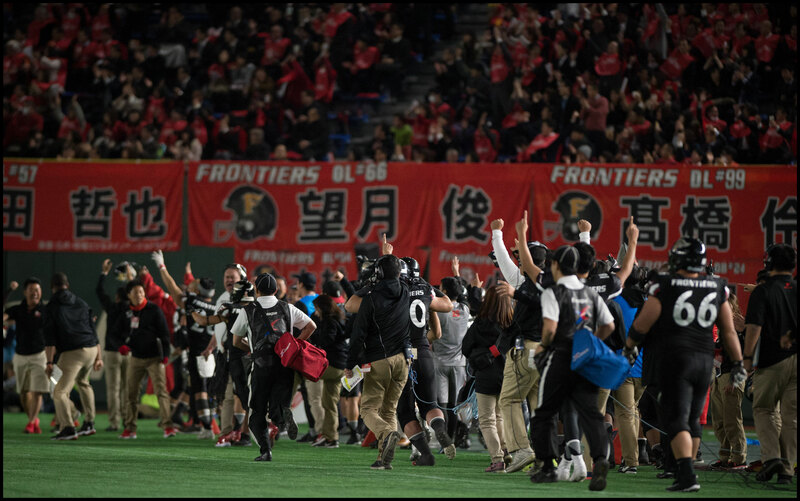 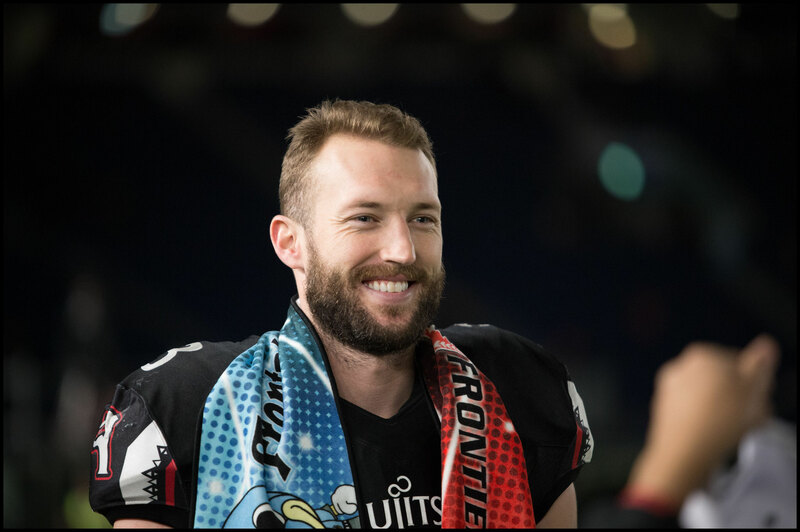 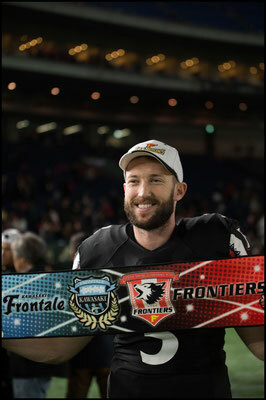 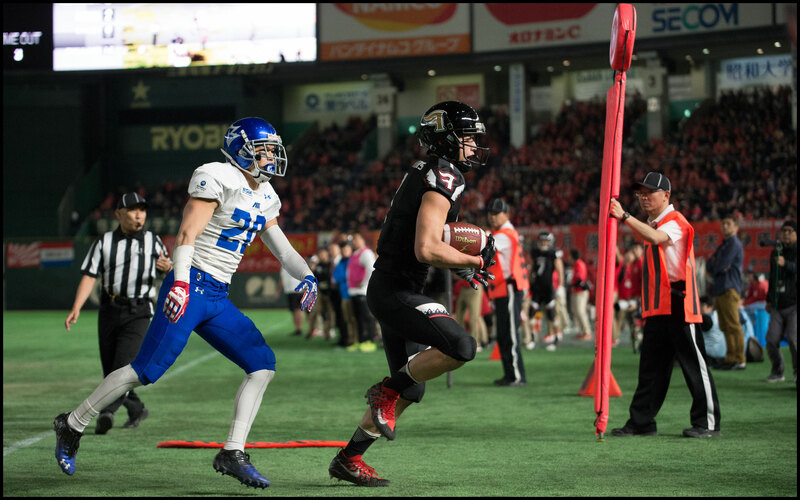 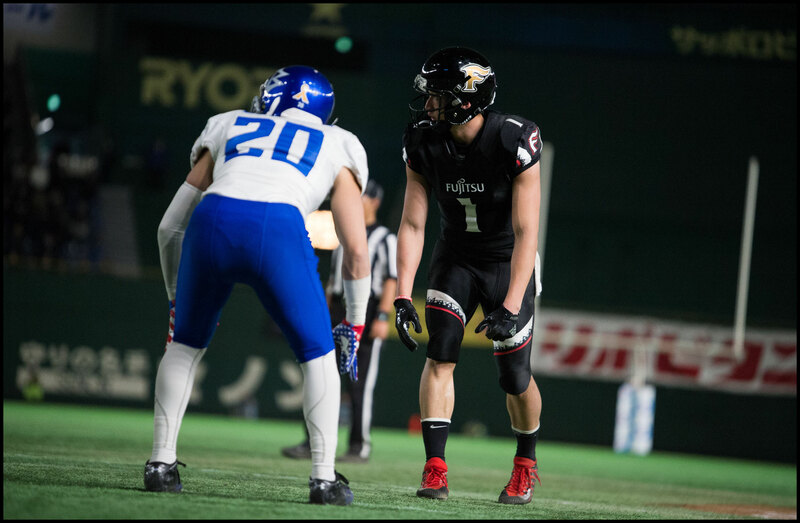 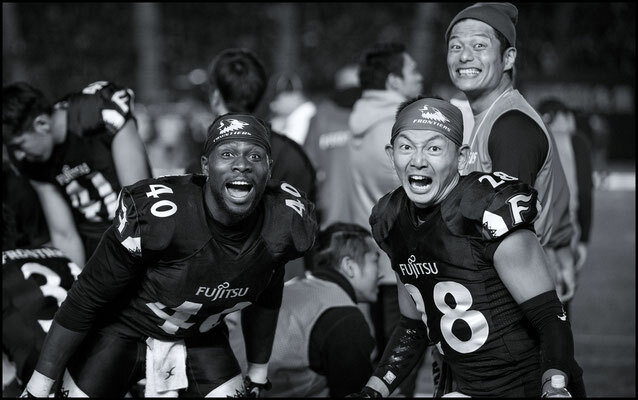 Fujitsu Frontiers rolled over IBM Big Blue 63 – 23 in the Japan X Bowl on Dec 18th to claim a second straight XLeague championship. 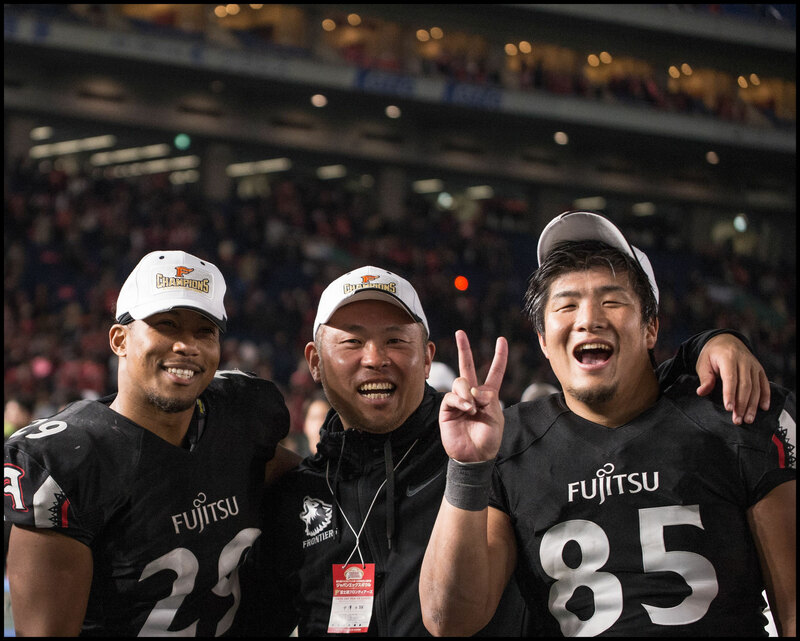 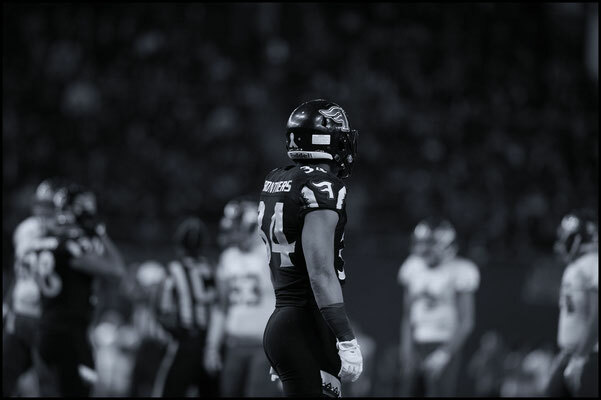 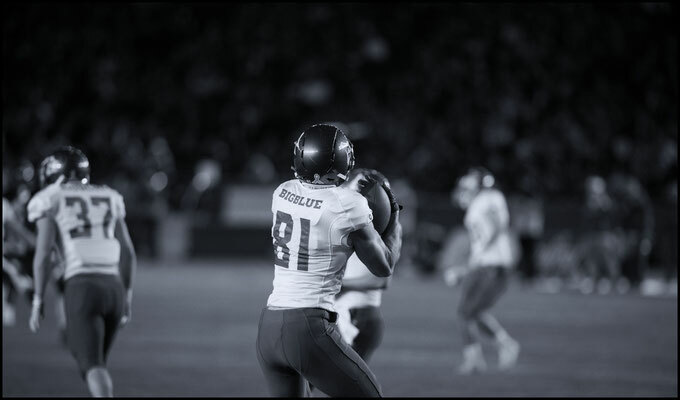 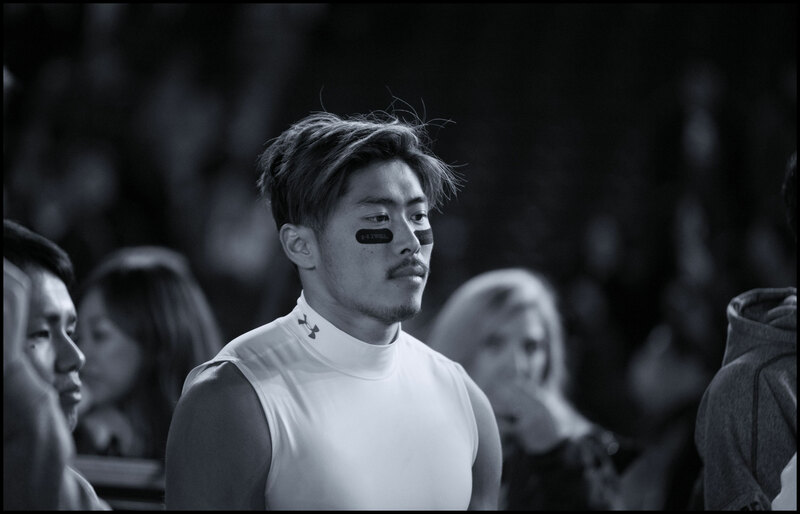 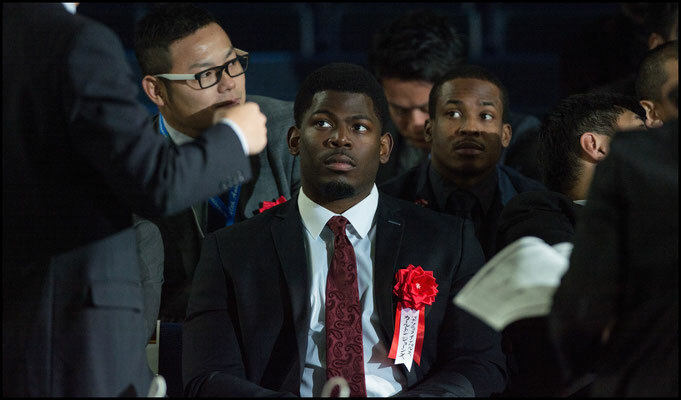 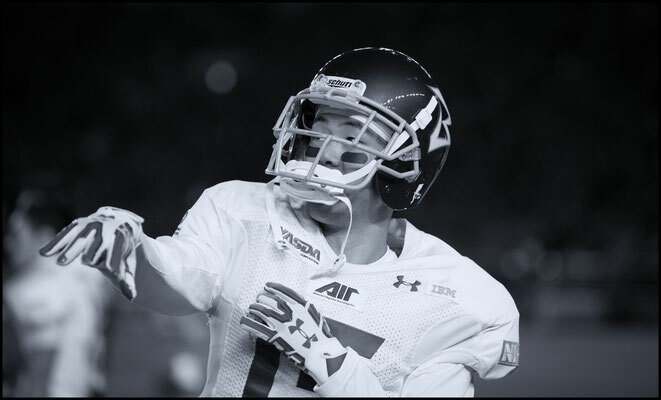 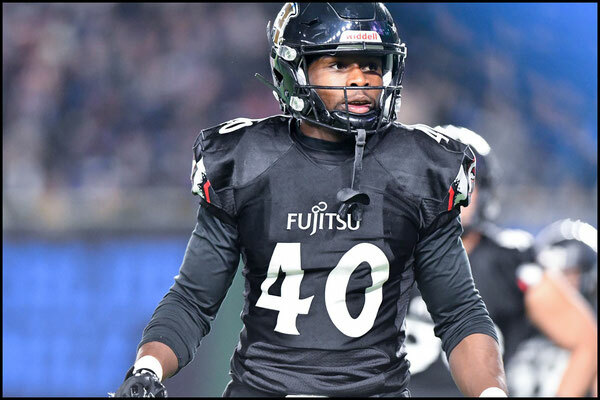 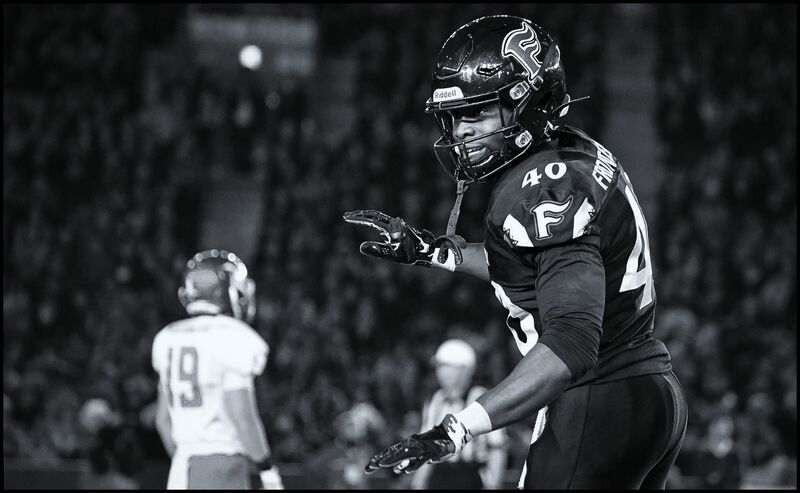 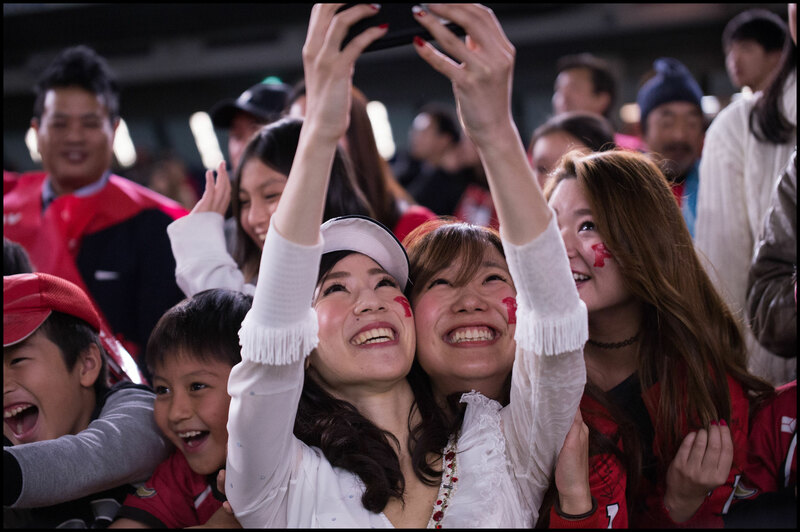 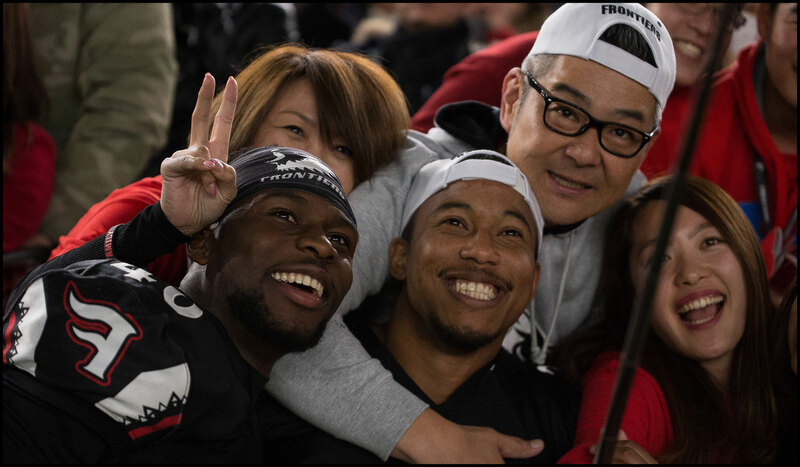 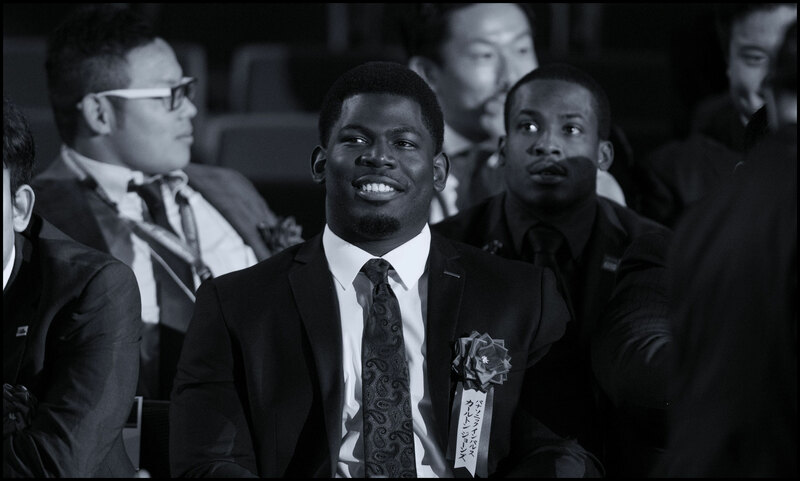 Making the title game for an unprecedented fifth year running, Fujitsu laid down a marker right from the get-go, returning the opening kickoff 99 yards for a TD in a scene reminiscent of Devin Hester in the Super Bowl ten years ago. 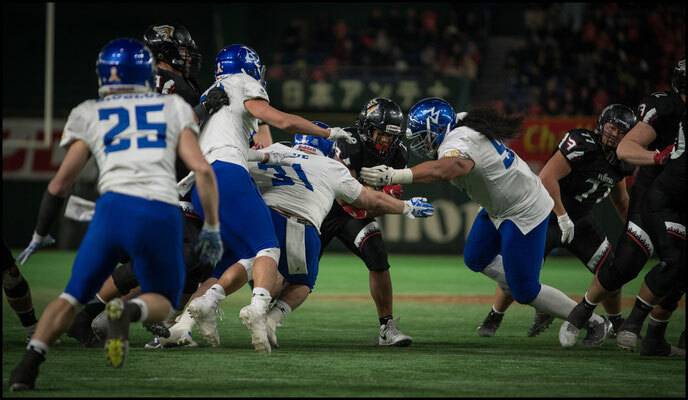 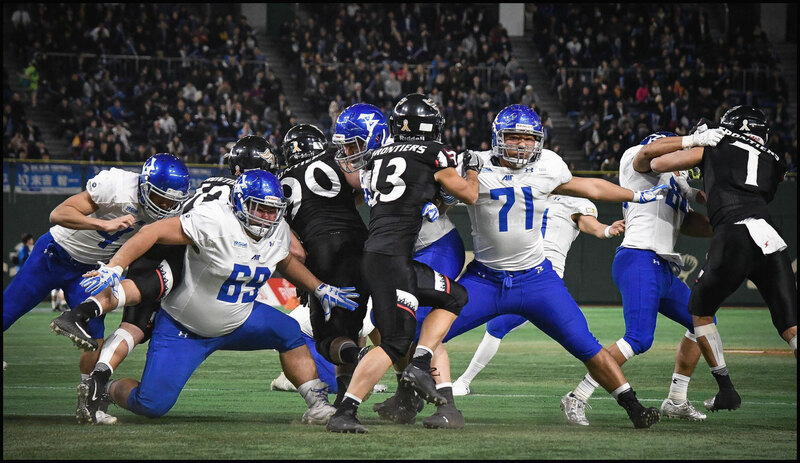 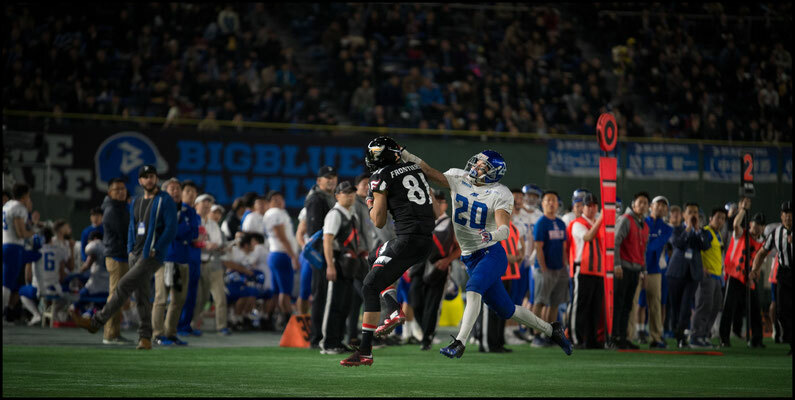 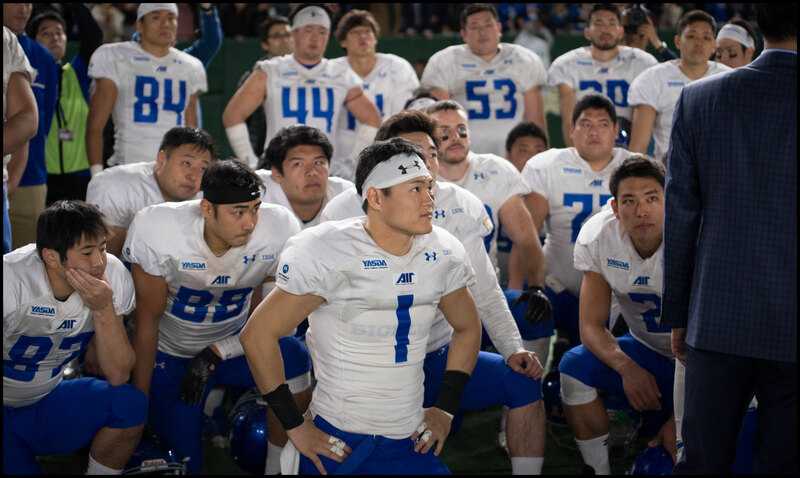 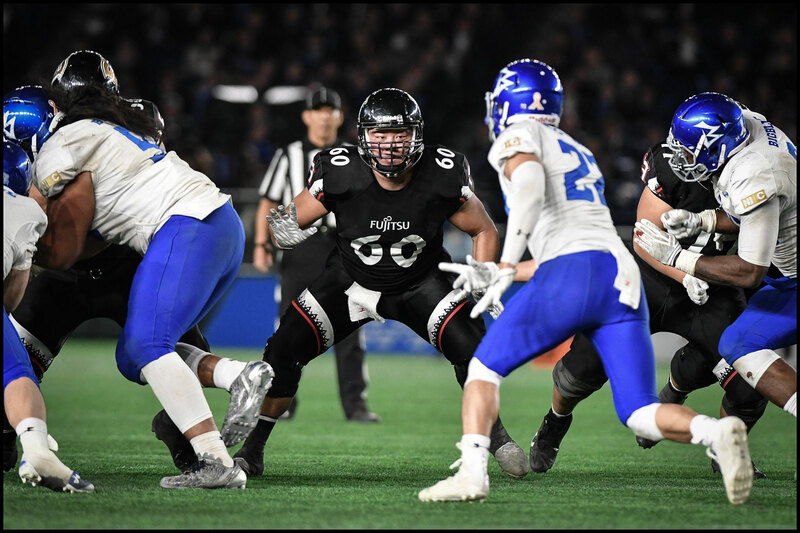 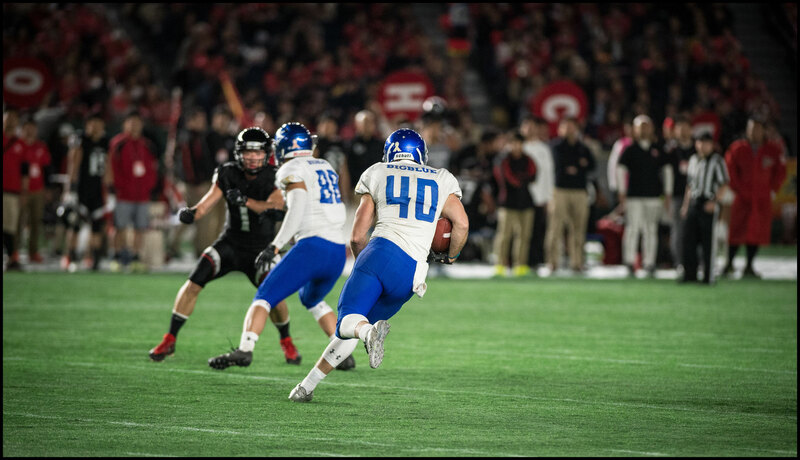 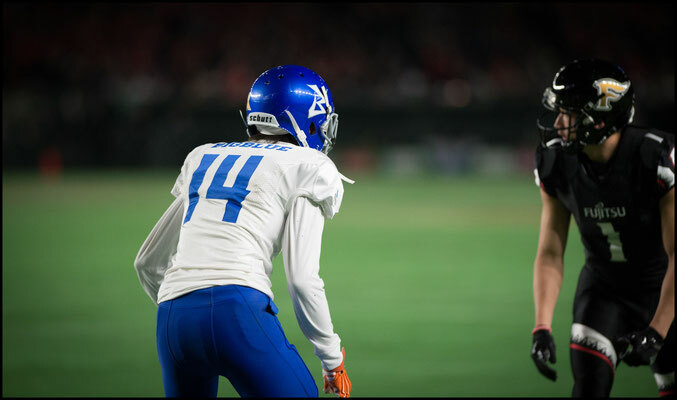 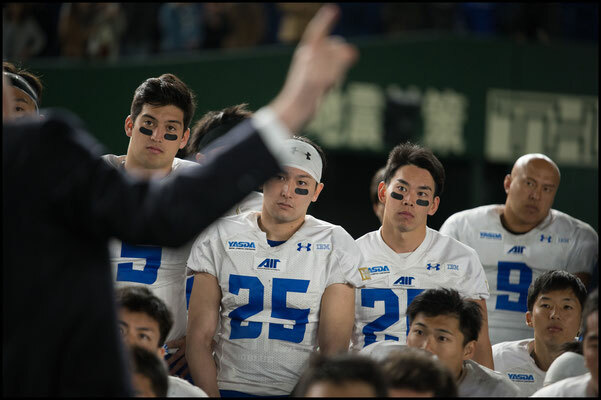 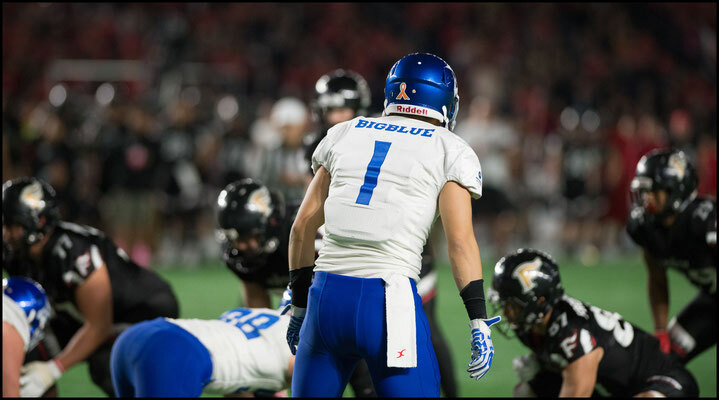 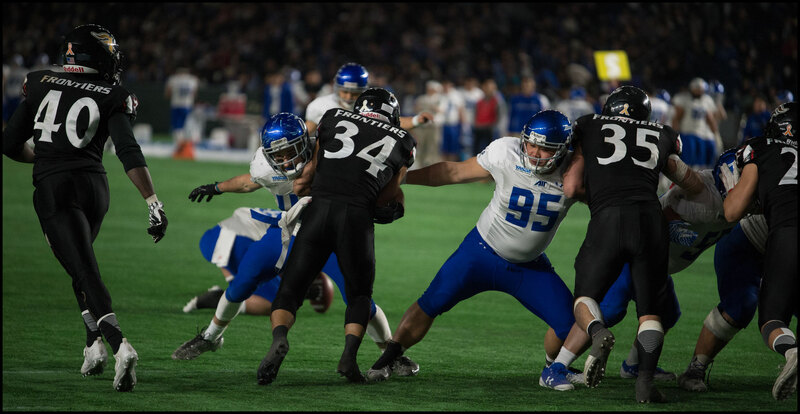 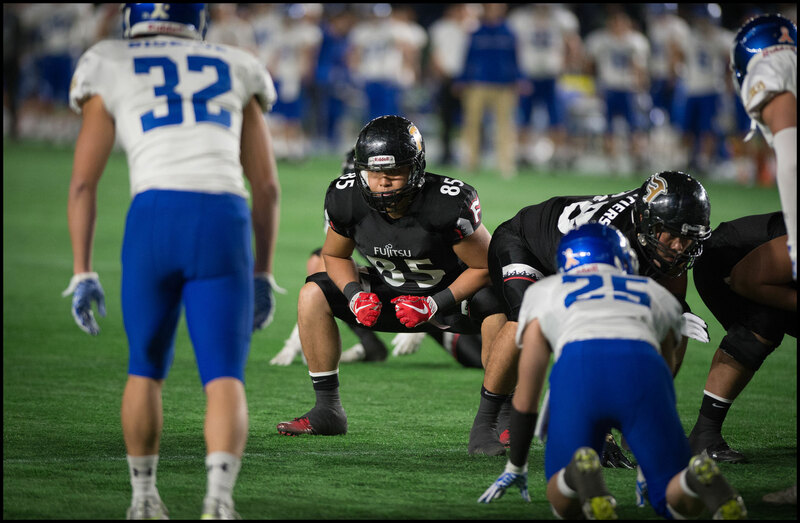 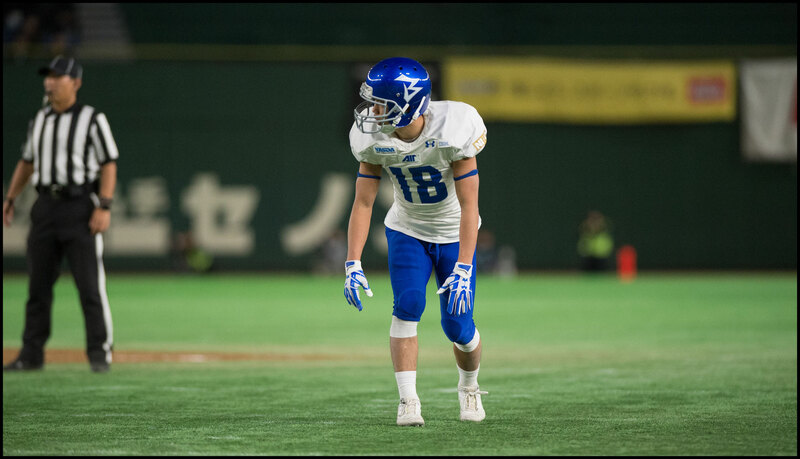 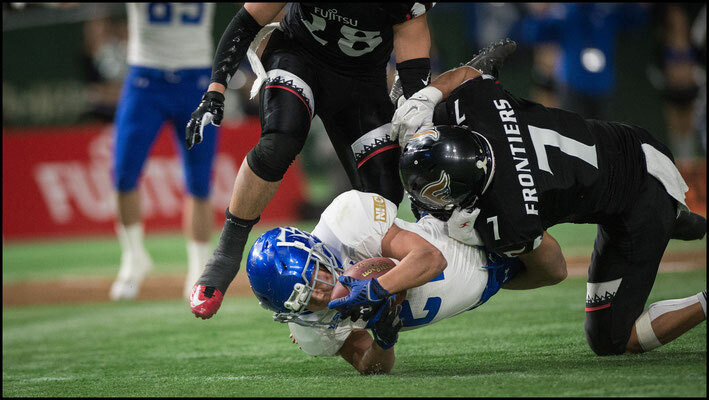 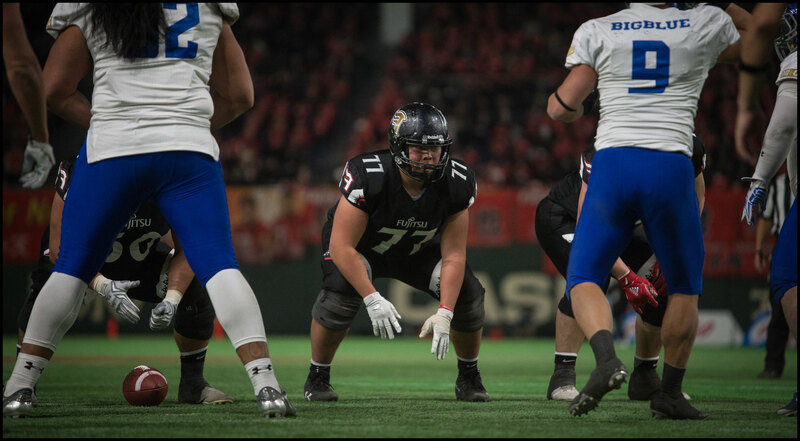 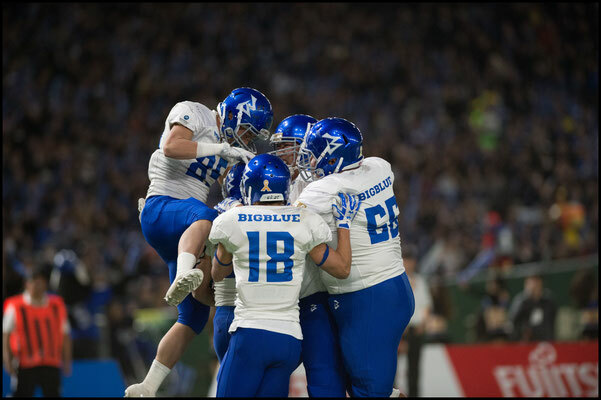 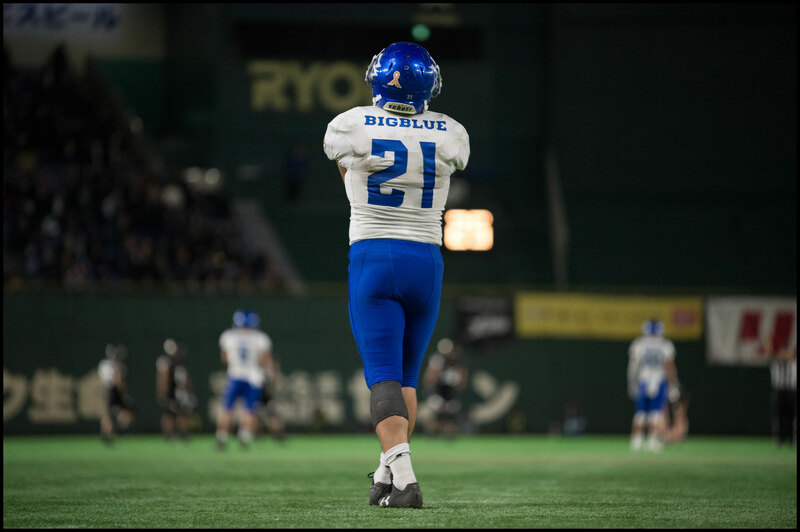 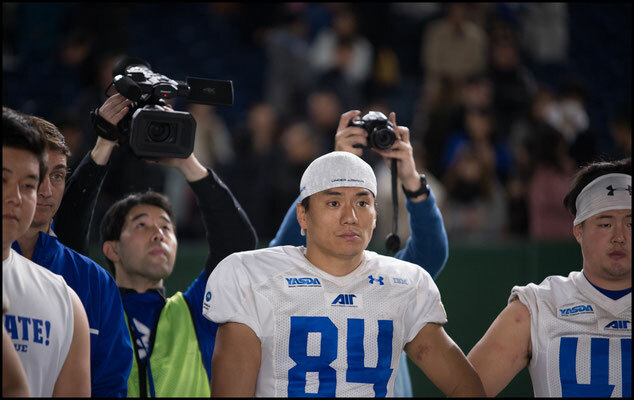 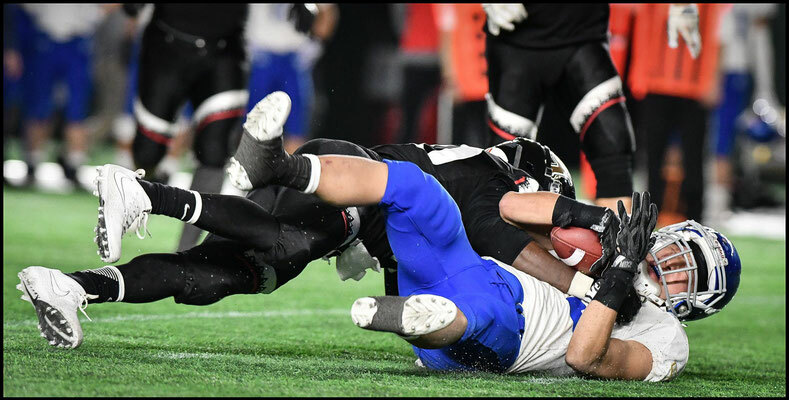 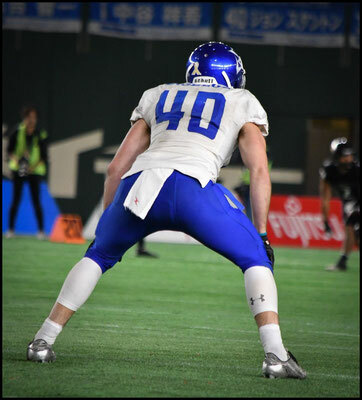 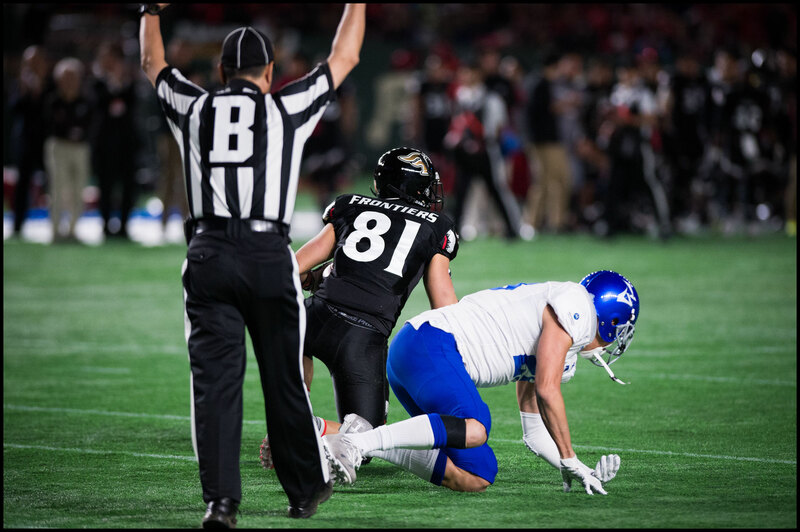 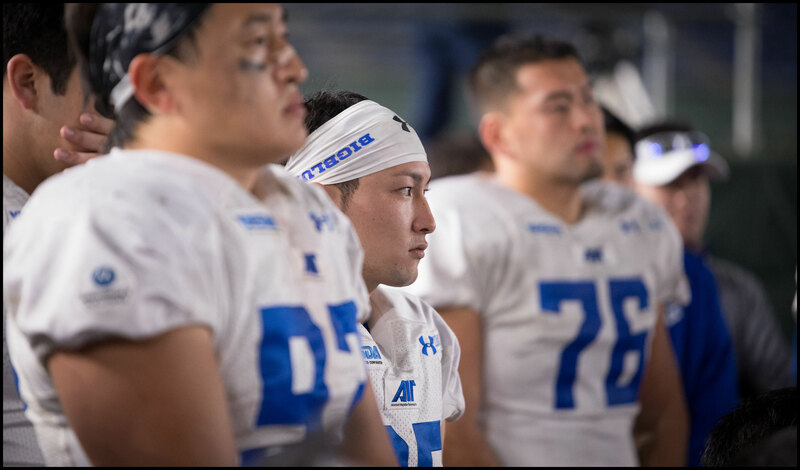 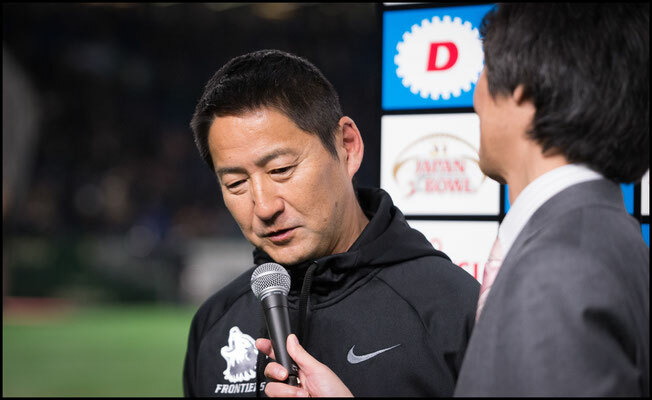 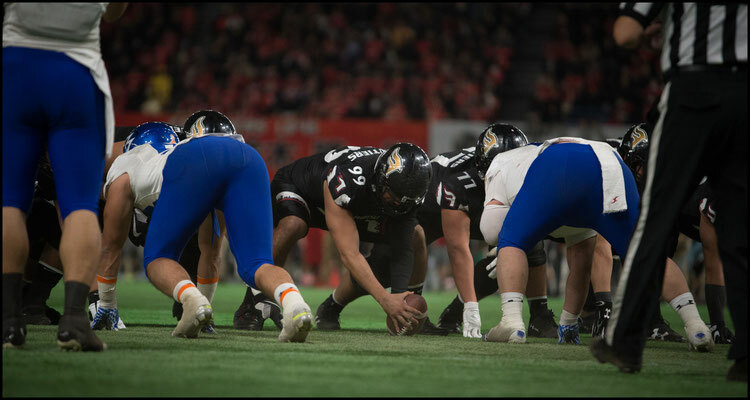 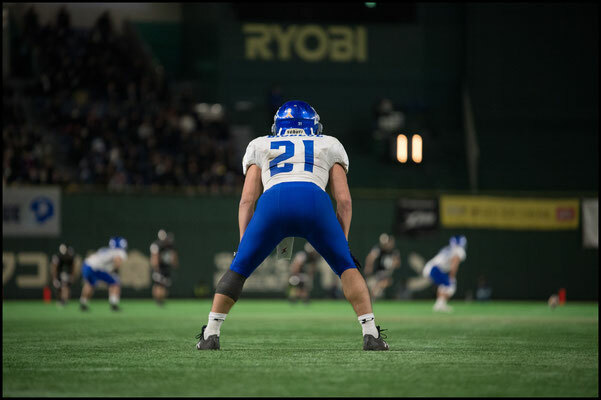 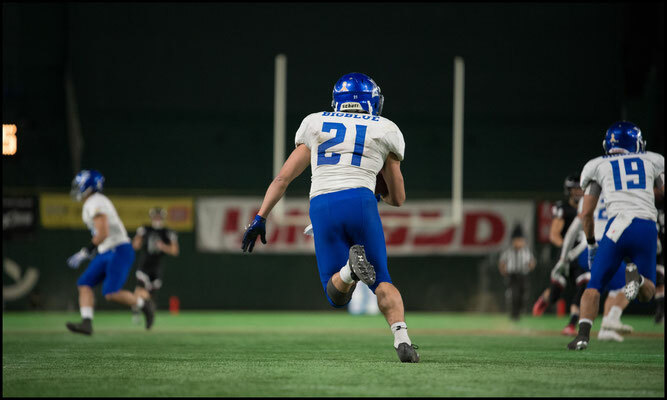 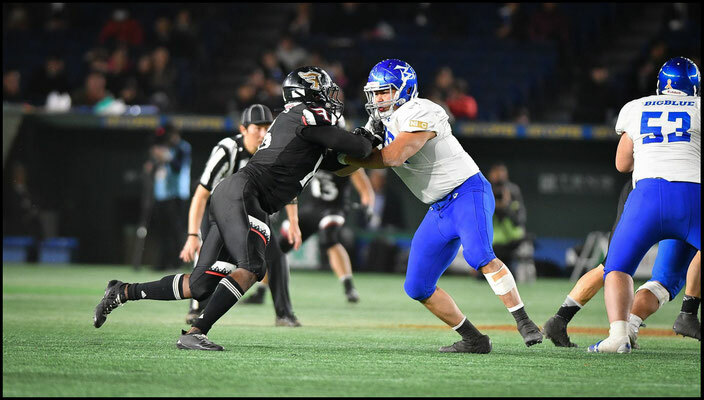 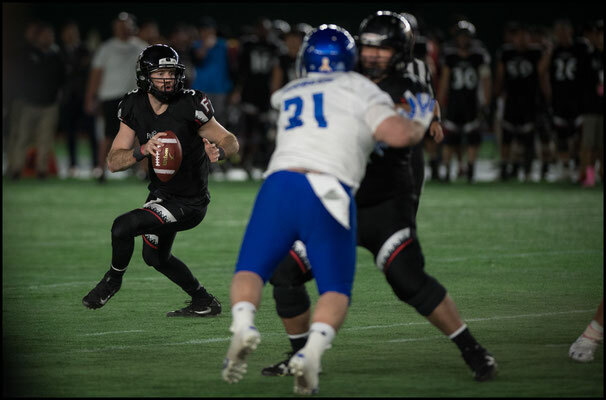 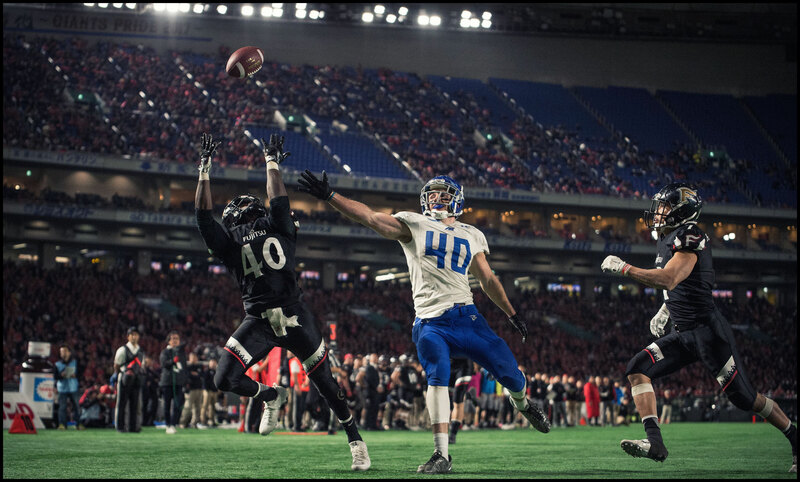 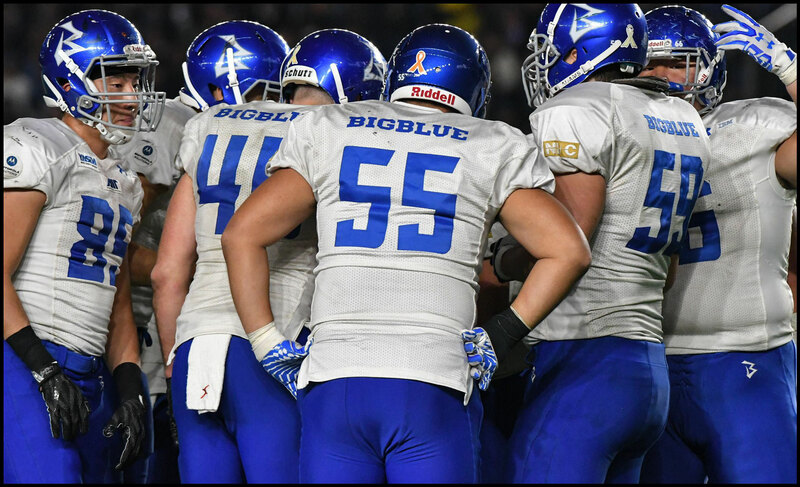 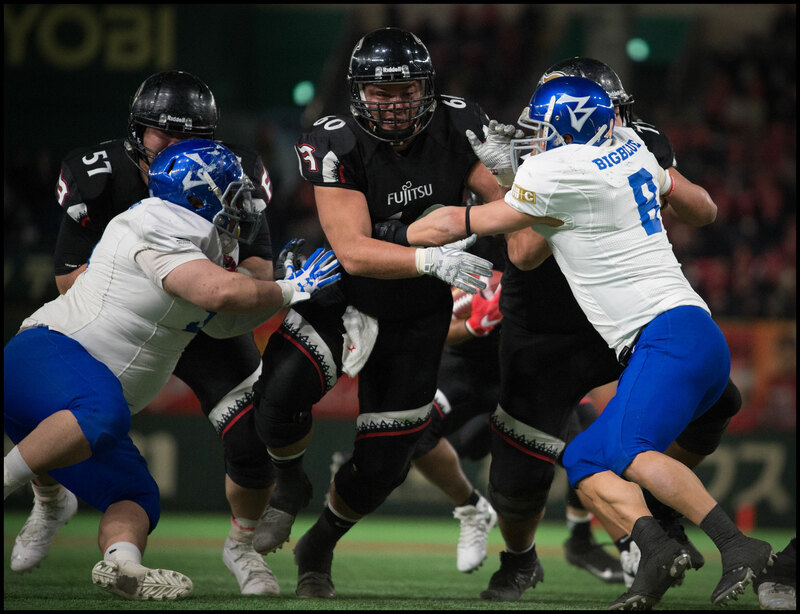 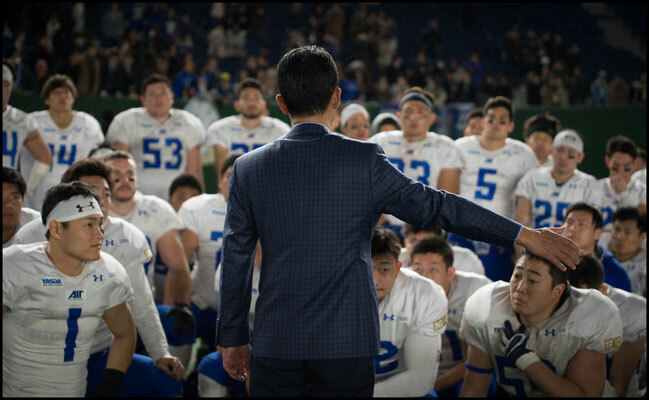 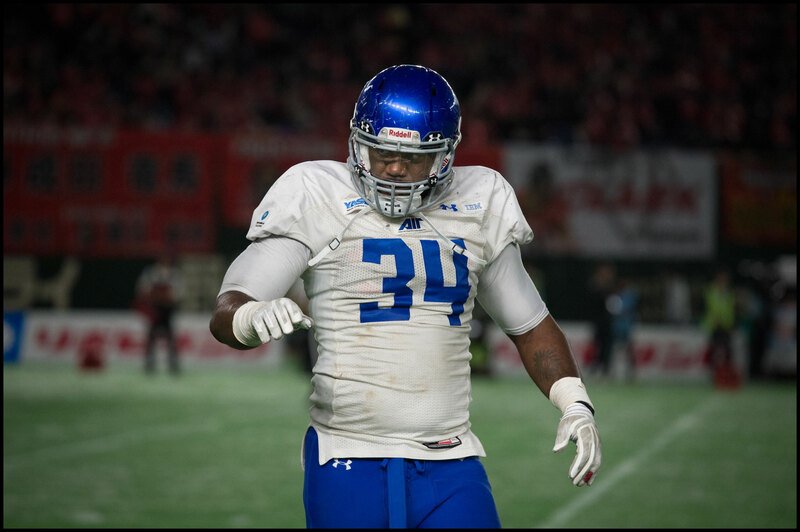 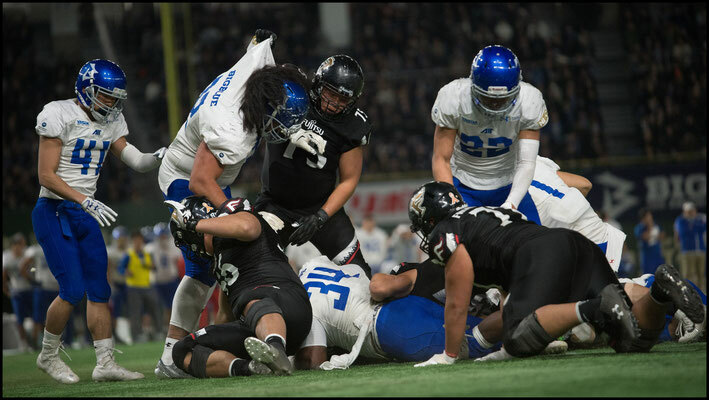 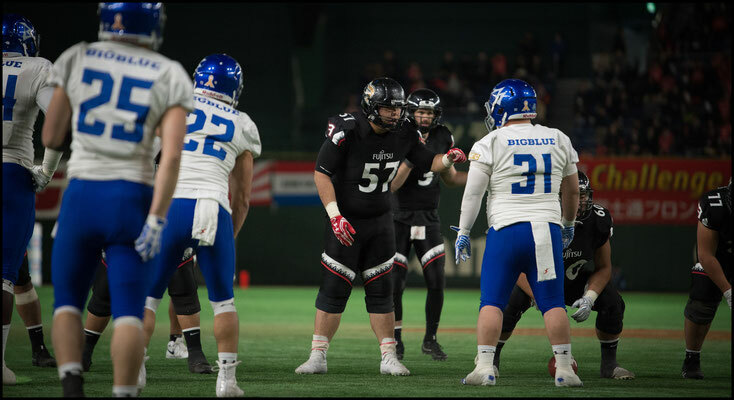 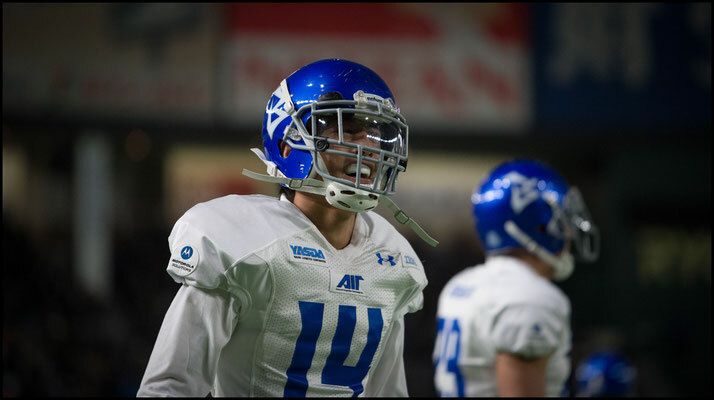 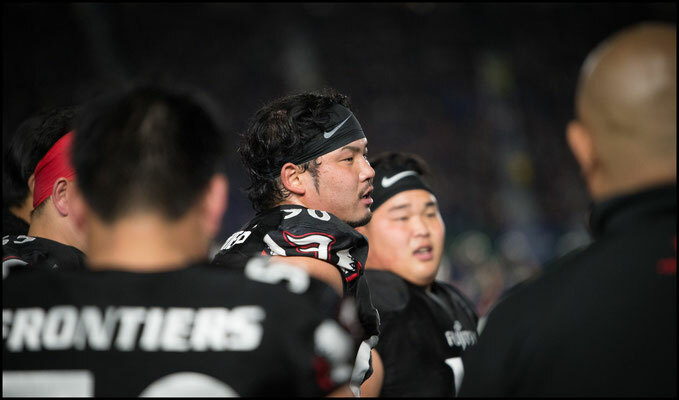 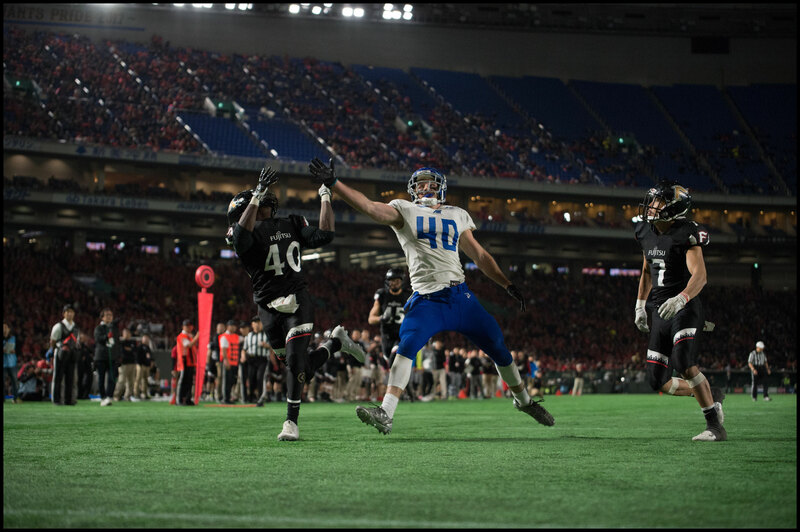 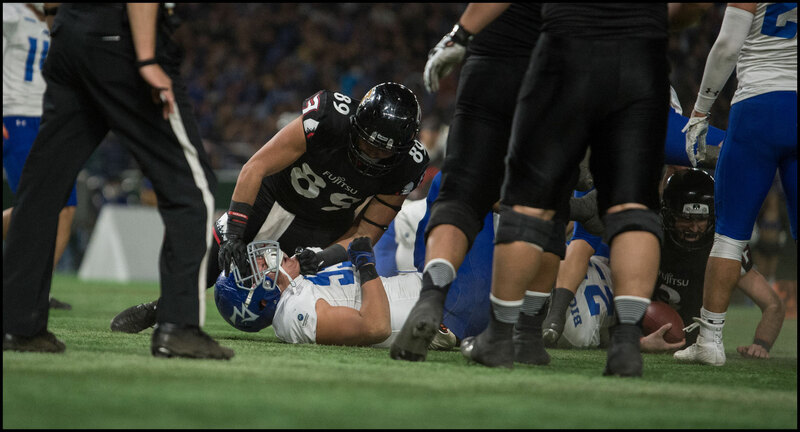 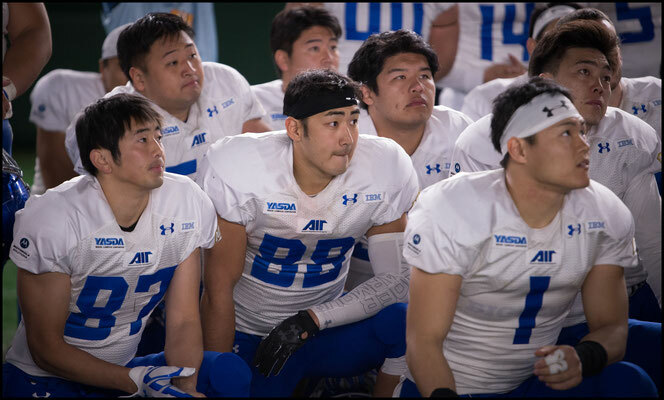 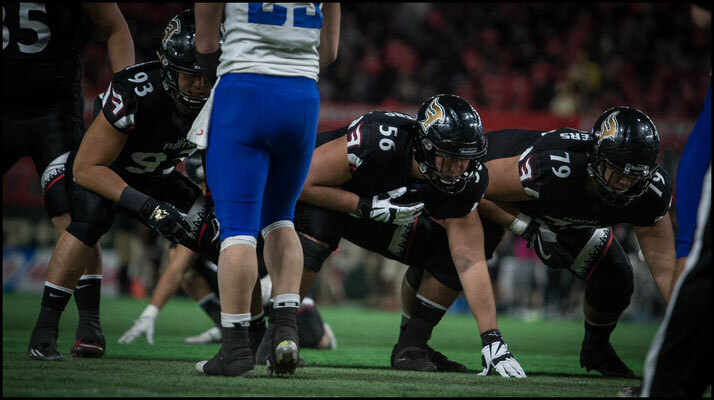 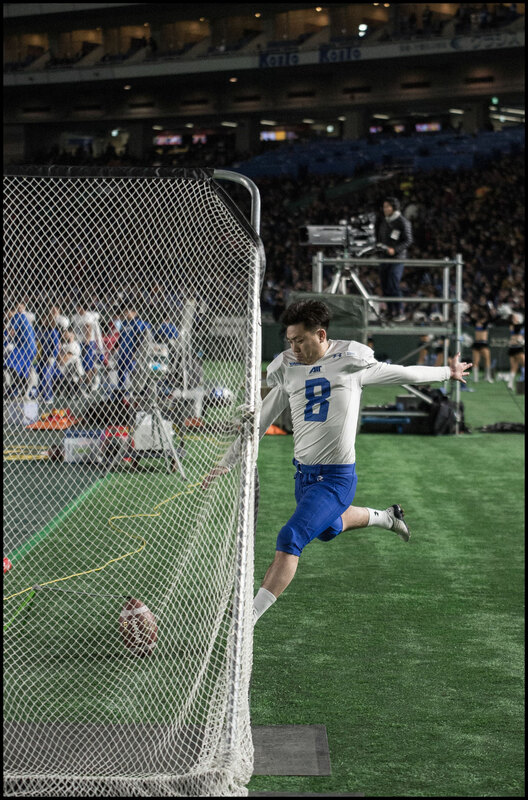 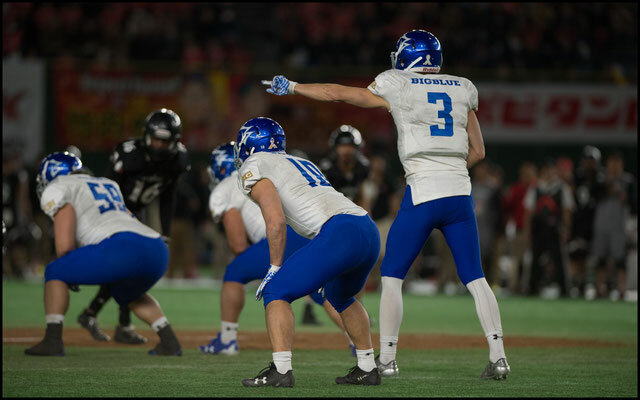 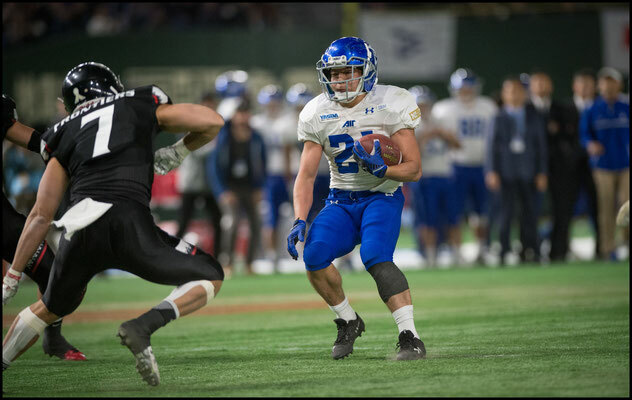 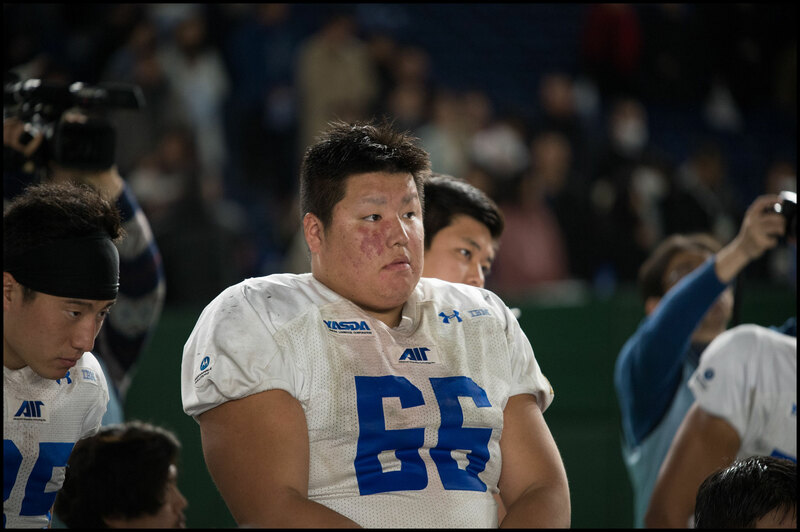 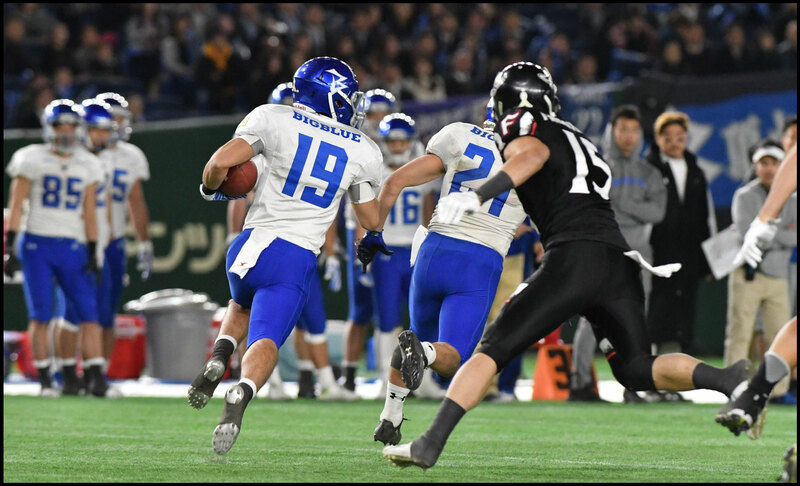 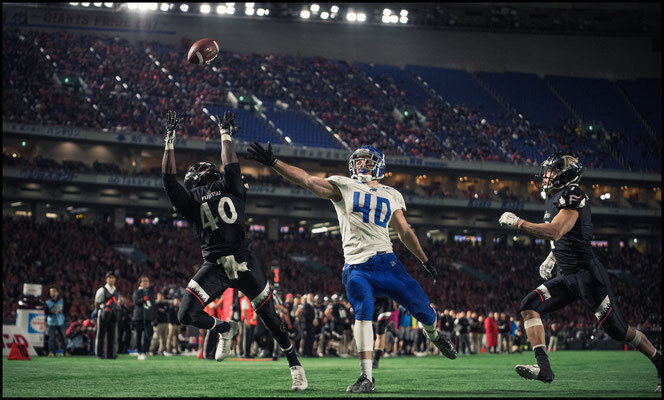 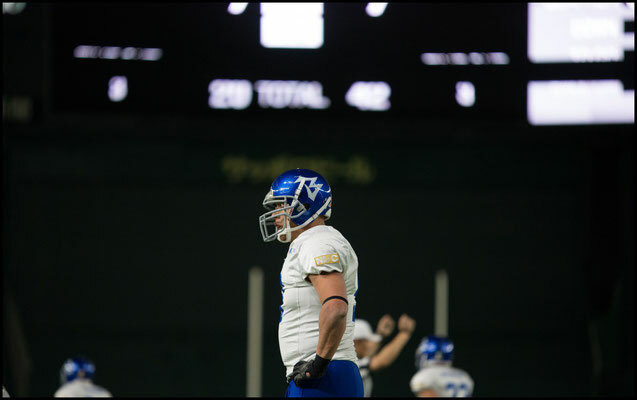 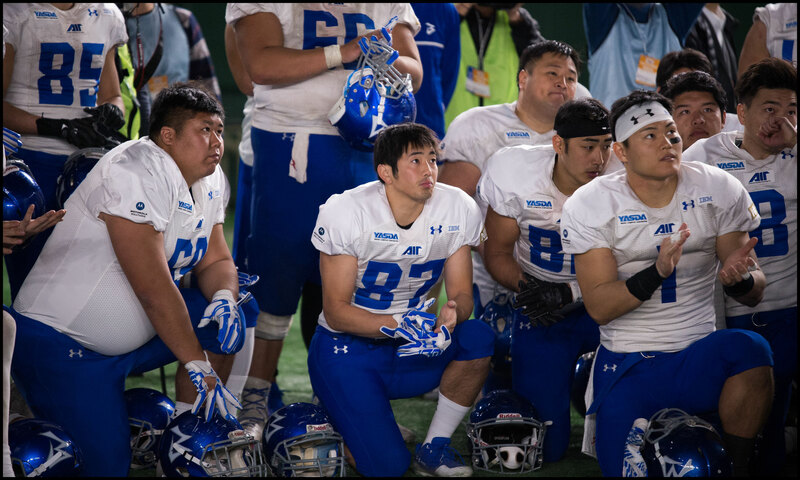 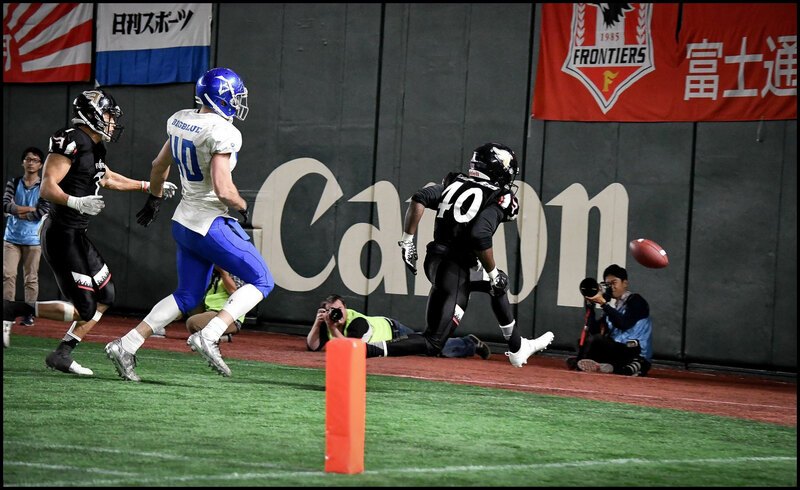 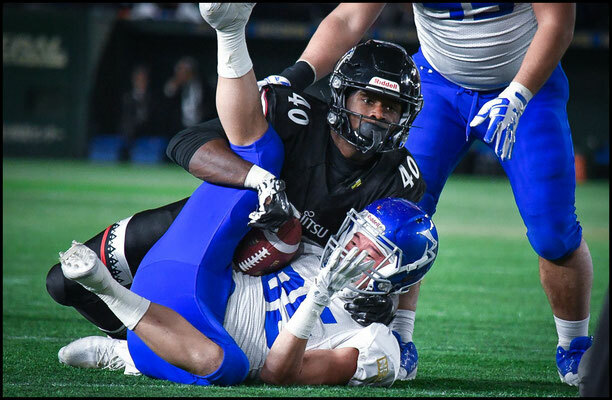 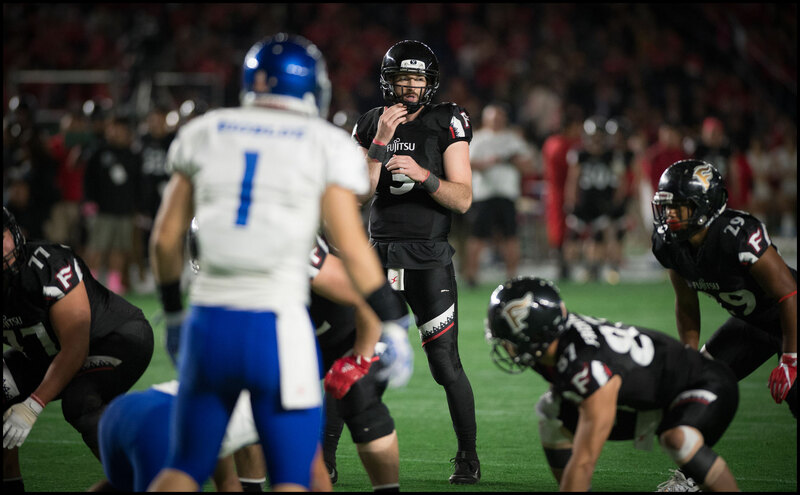 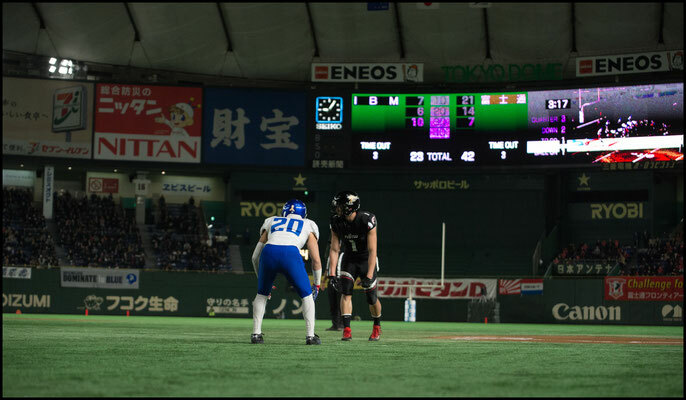 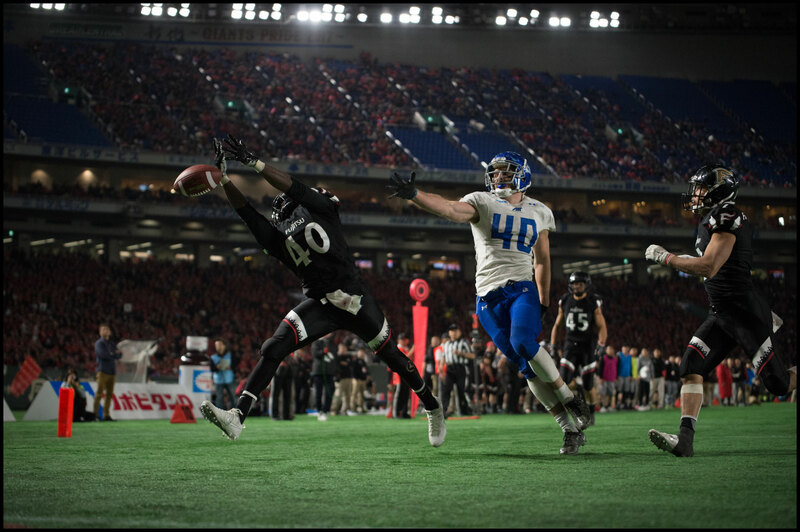 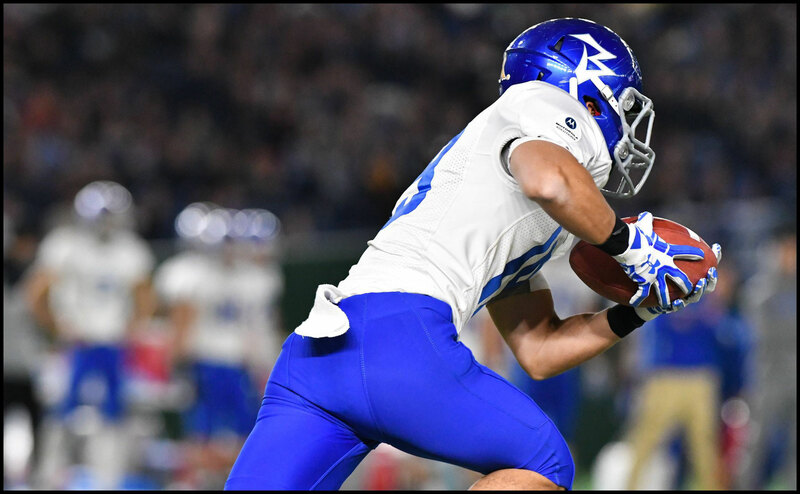 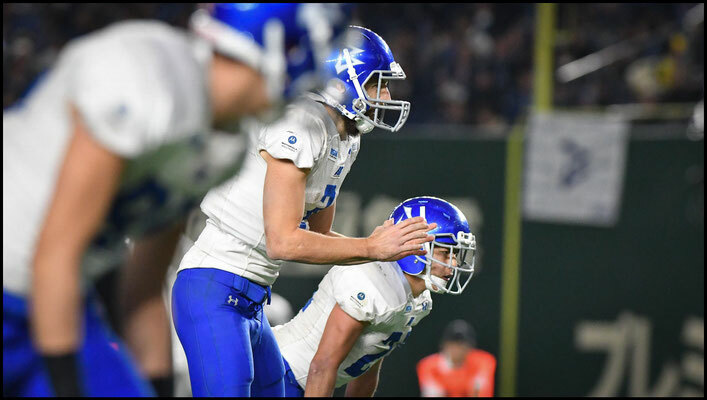 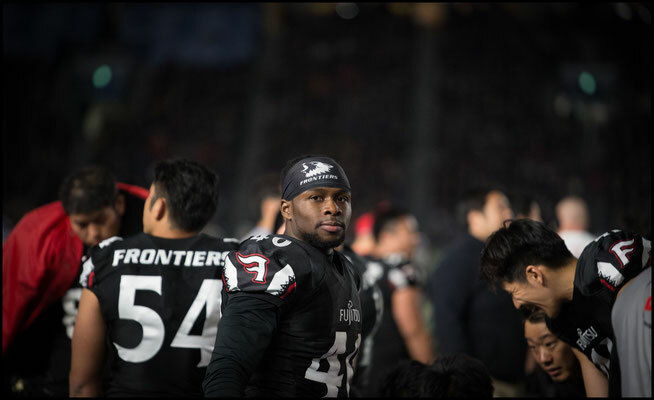 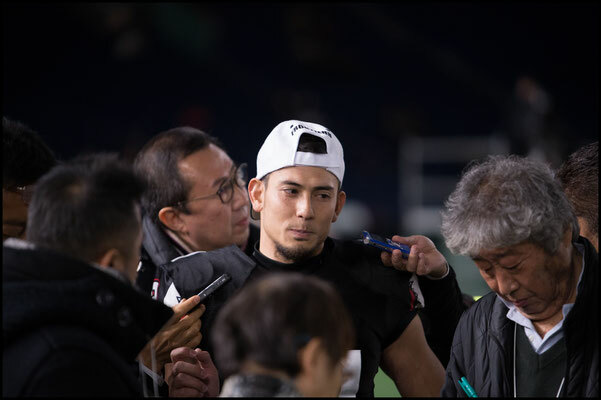 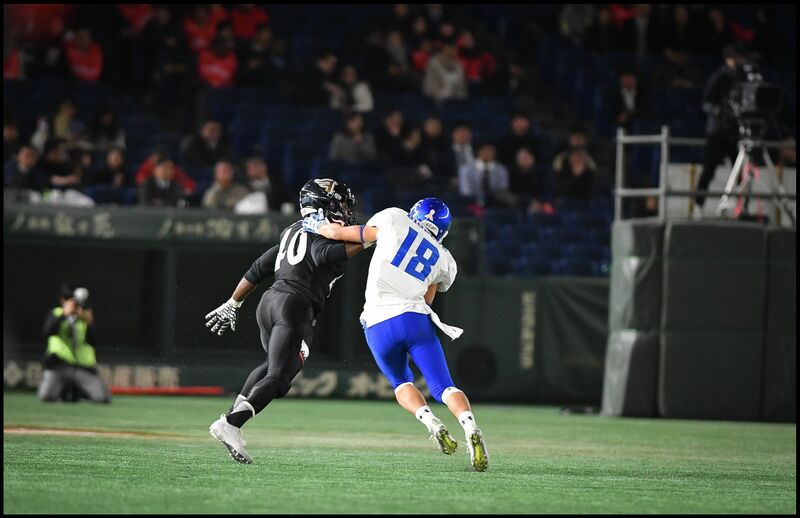 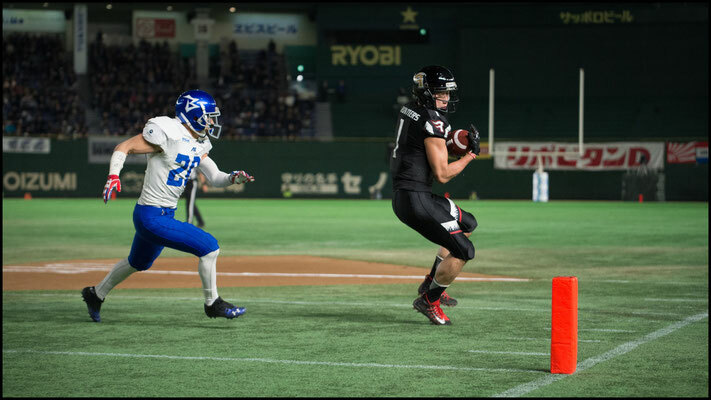 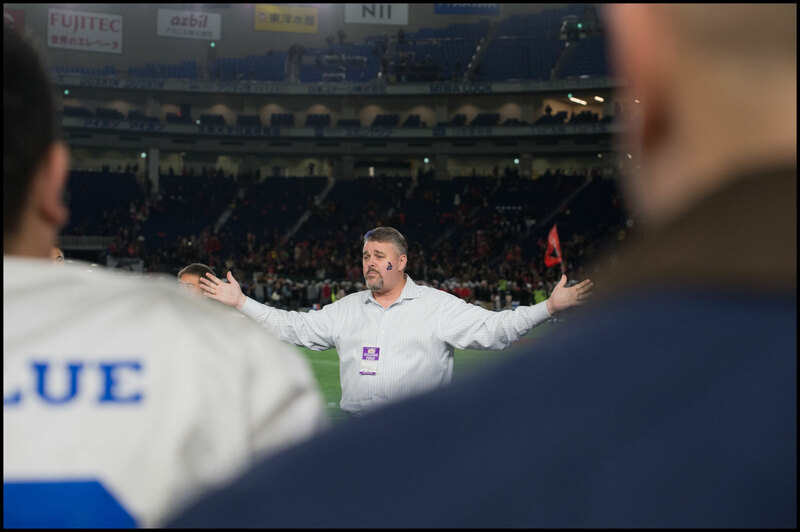 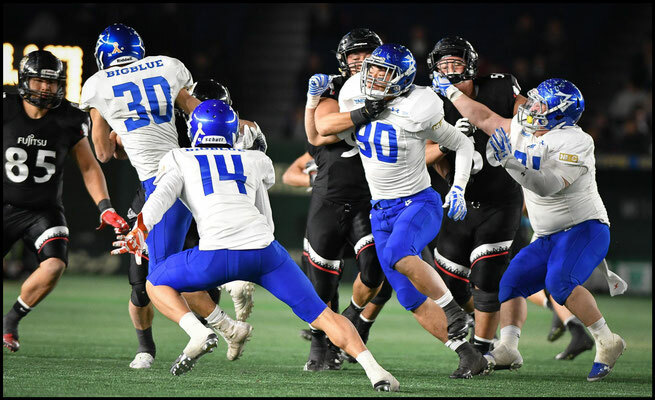 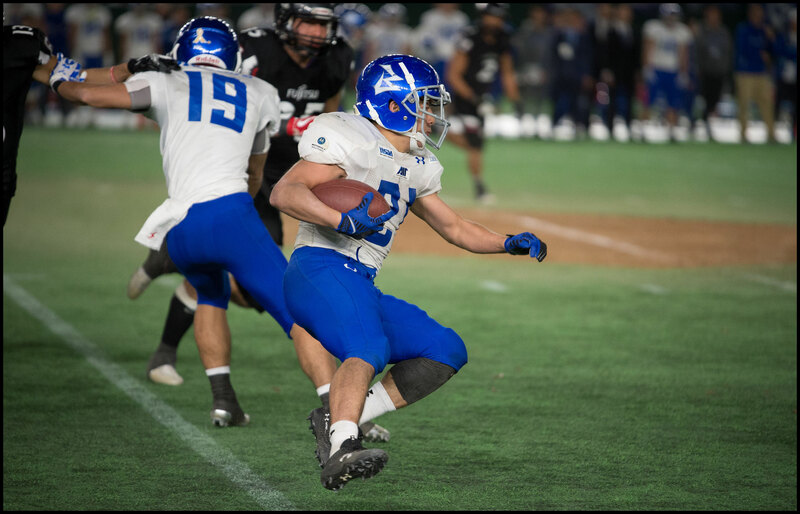 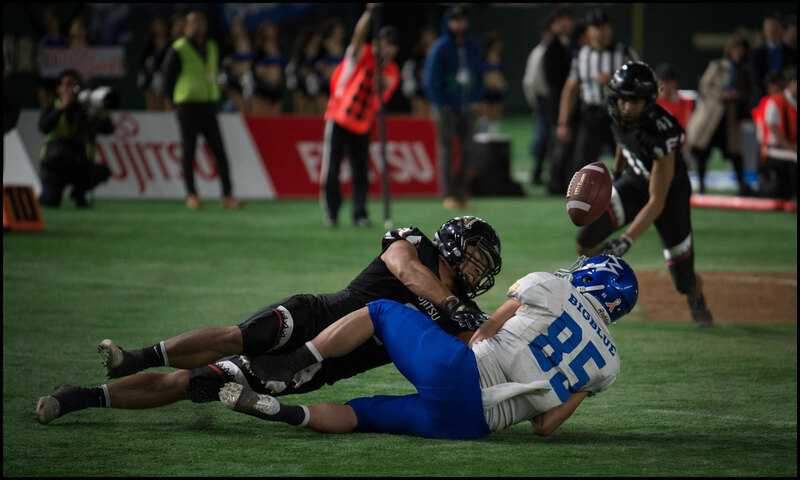 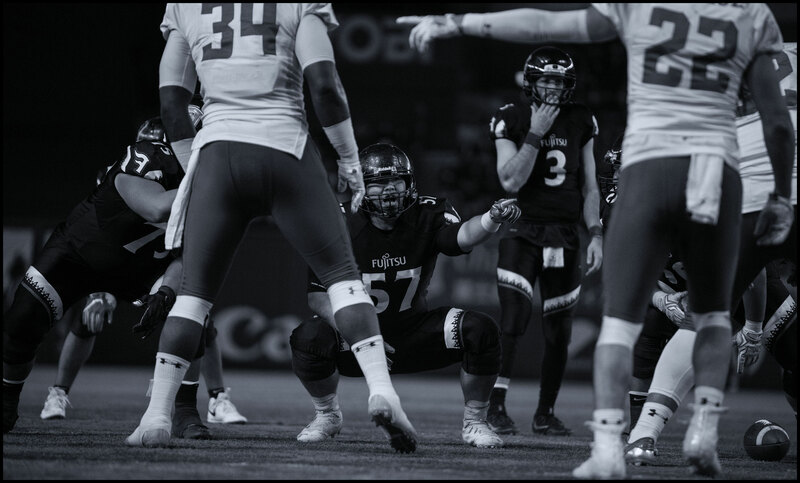 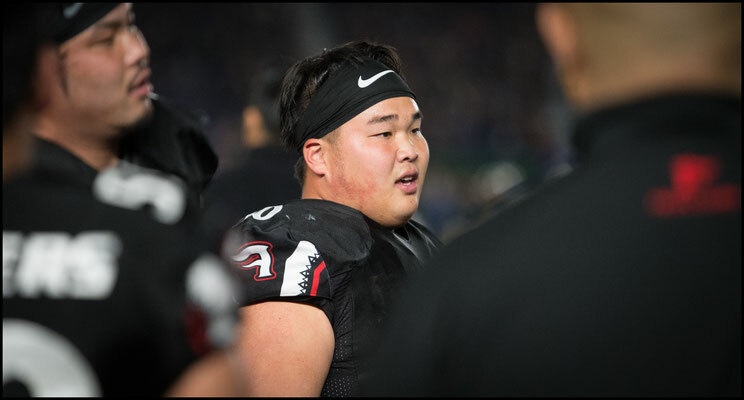 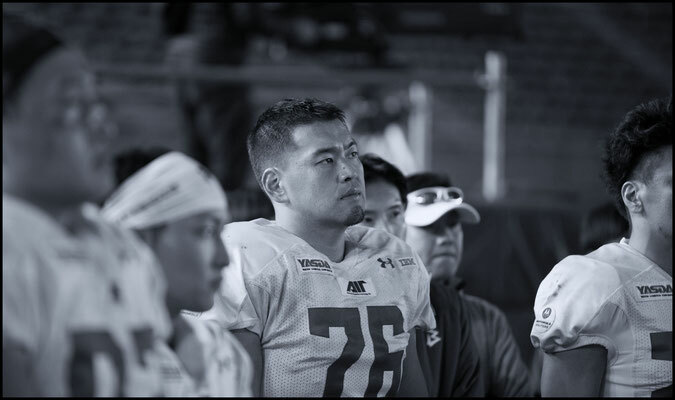 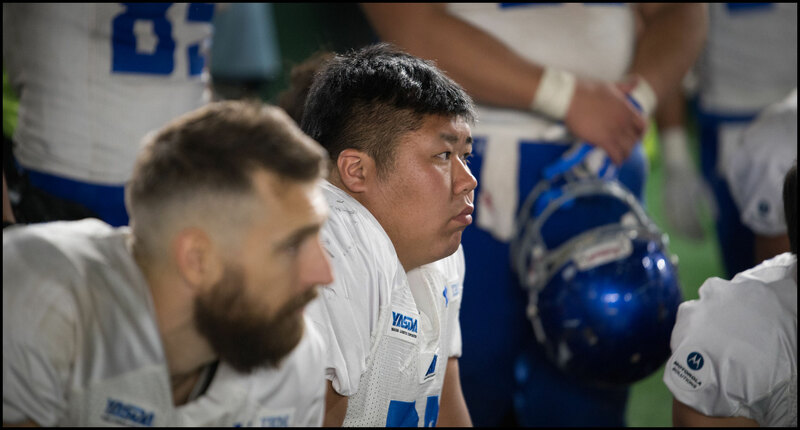 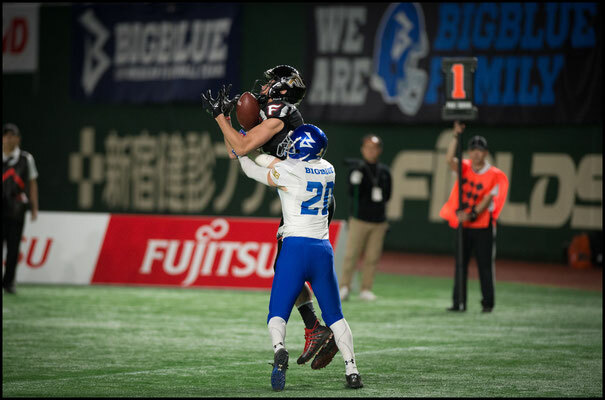 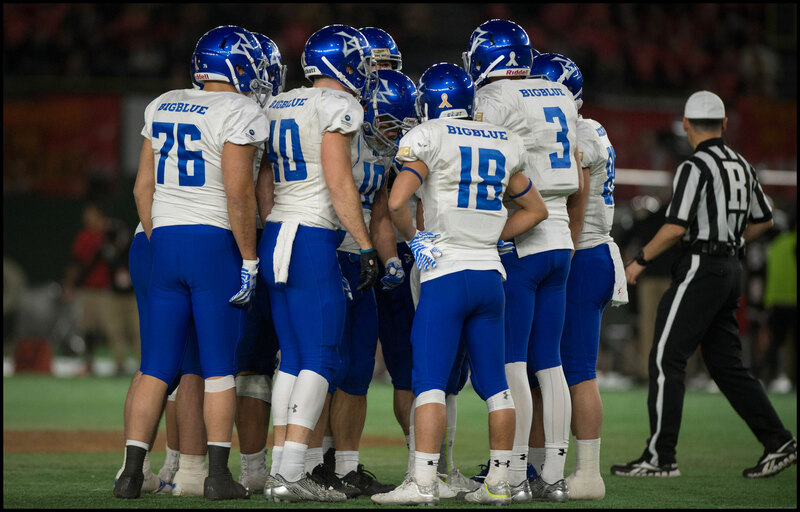 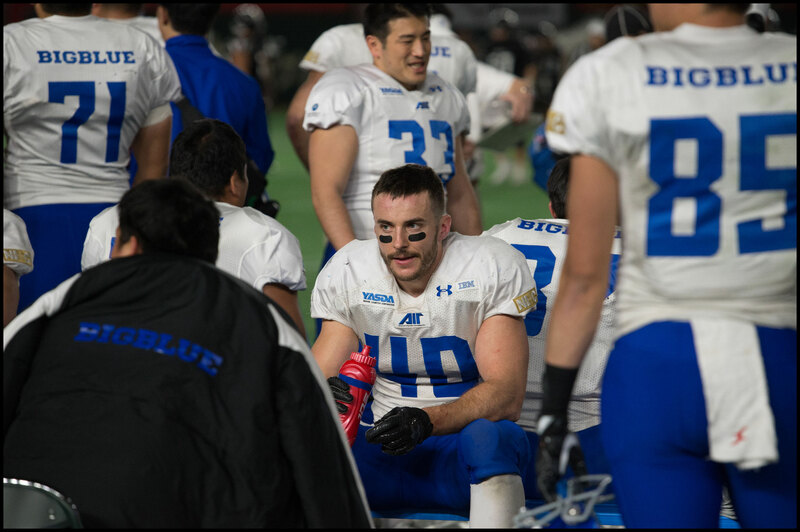 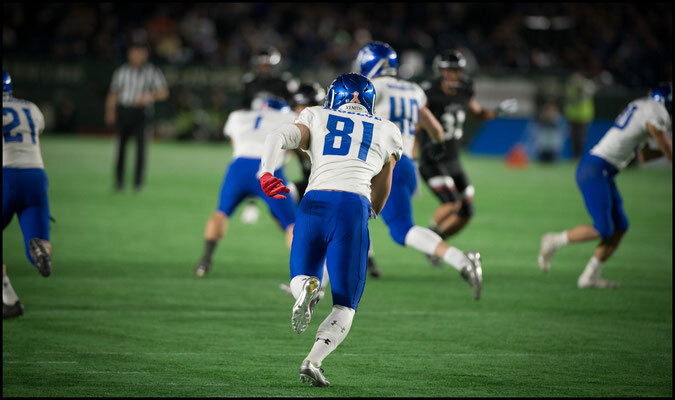 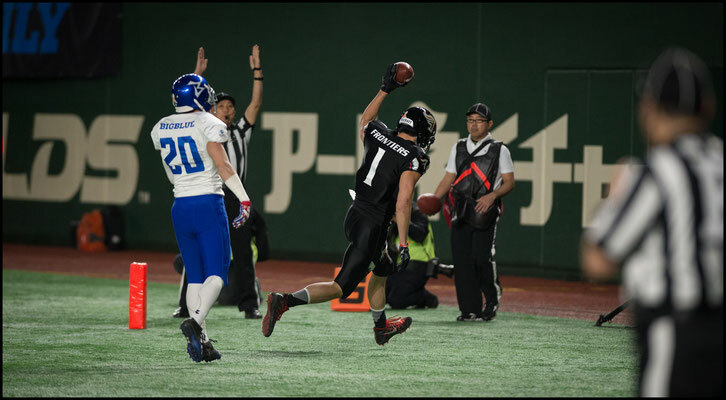 Though Big Blue hit back immediately with a 70-yard drive of their own that culminated in a Ryo Takagi rushing TD, the Chiba side’s much vaunted offense was unable to keep up with a Frontiers team that clicked fully for the first time all season. 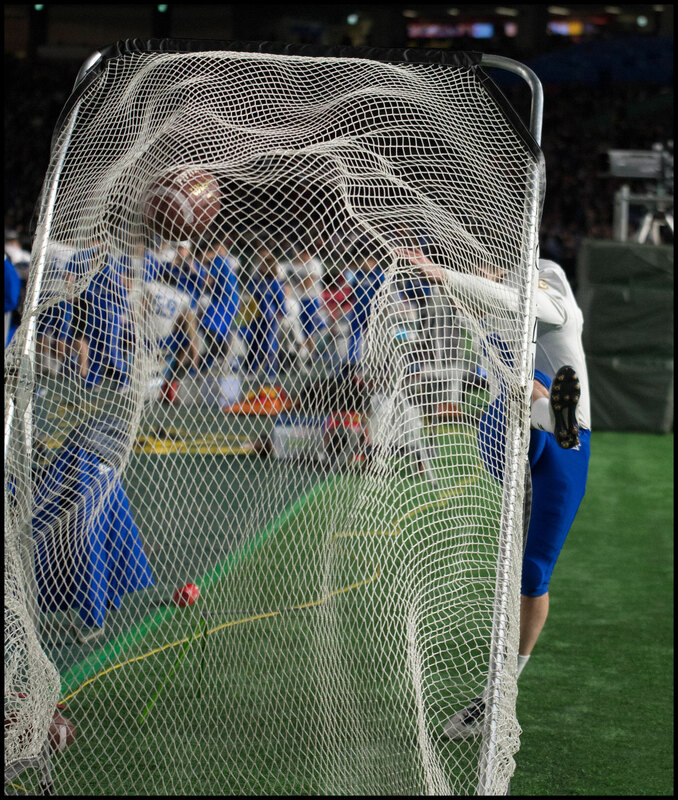 Wideout Clark Nakamura was the star of the show, hauling in seven passes for a JXB record 203 yards. 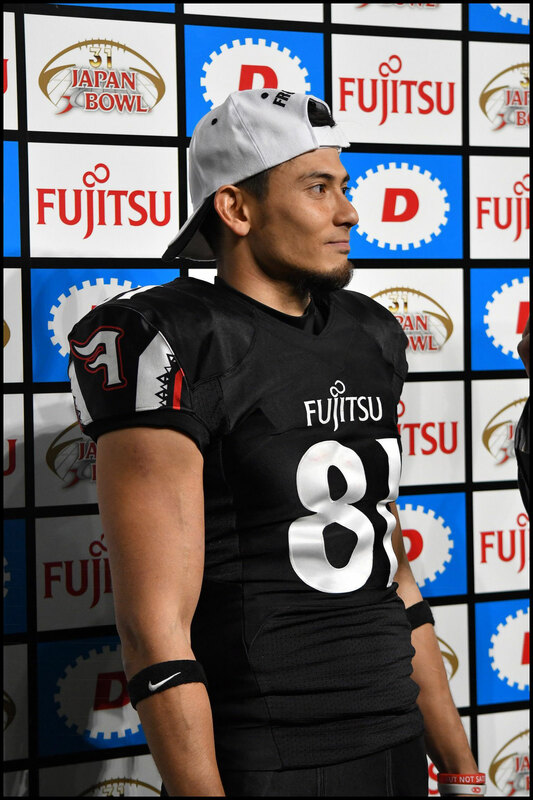 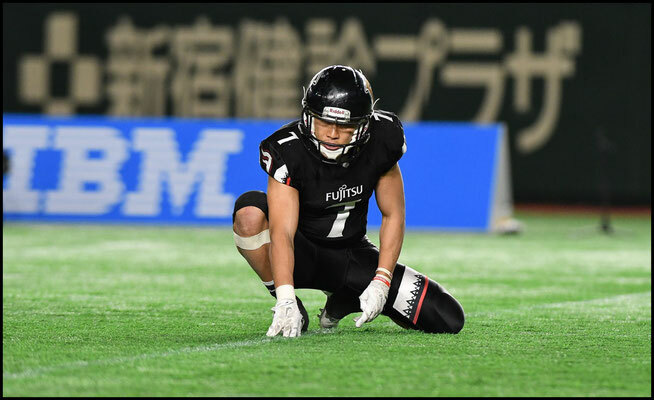 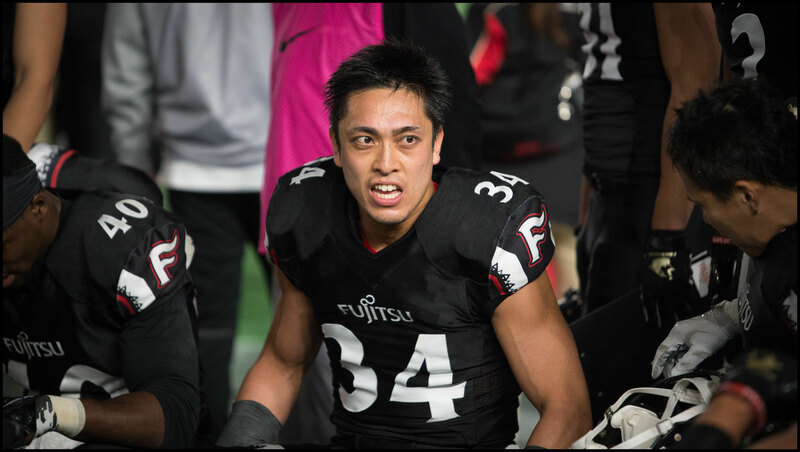 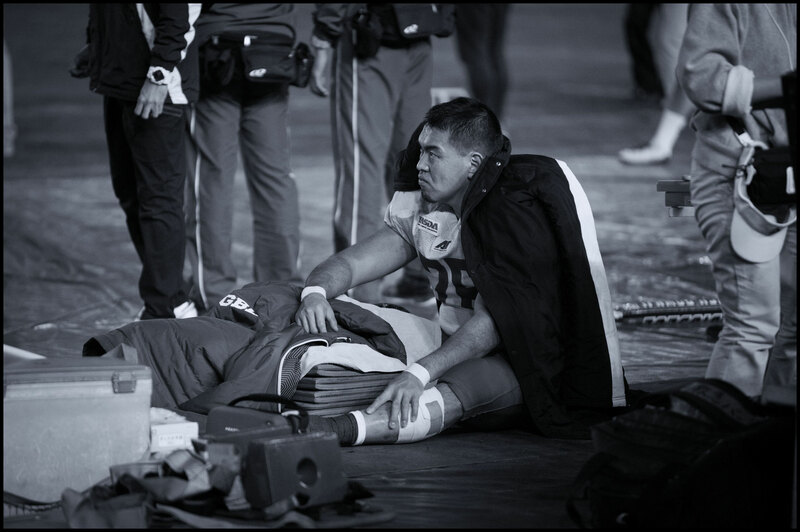 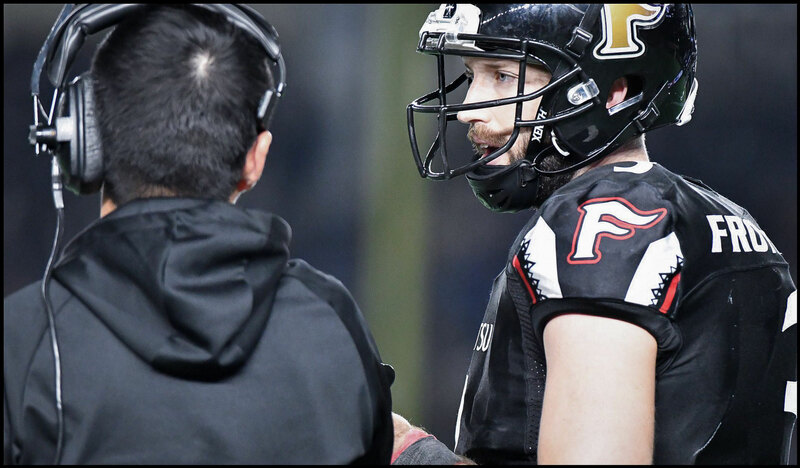 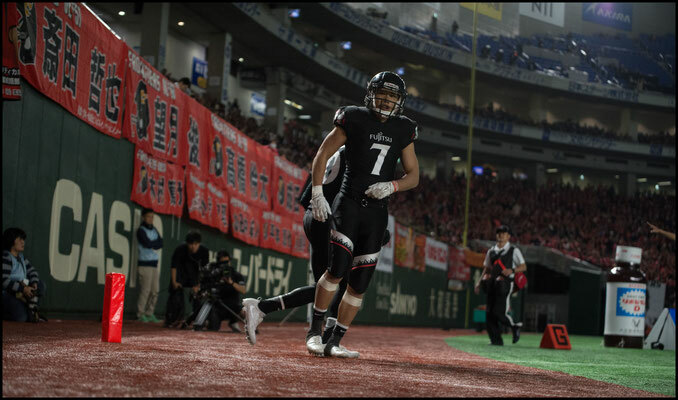 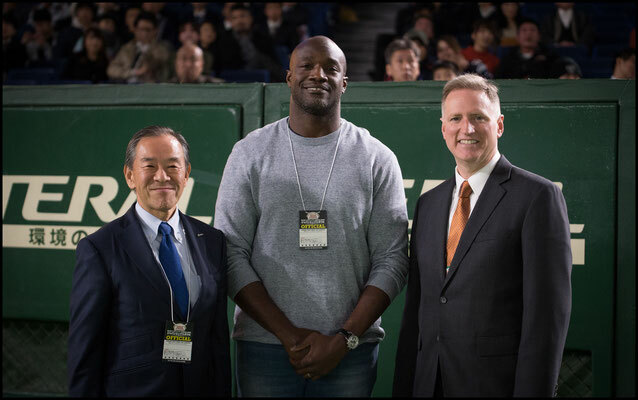 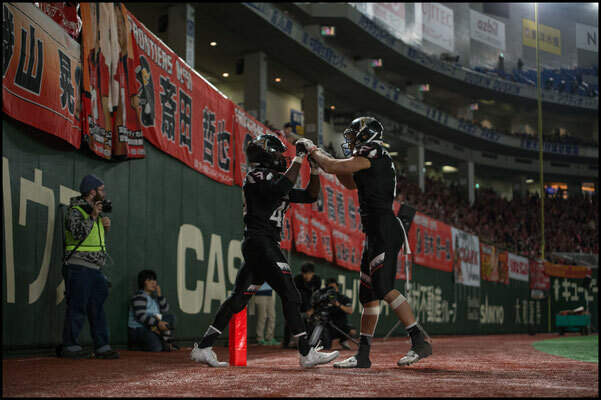 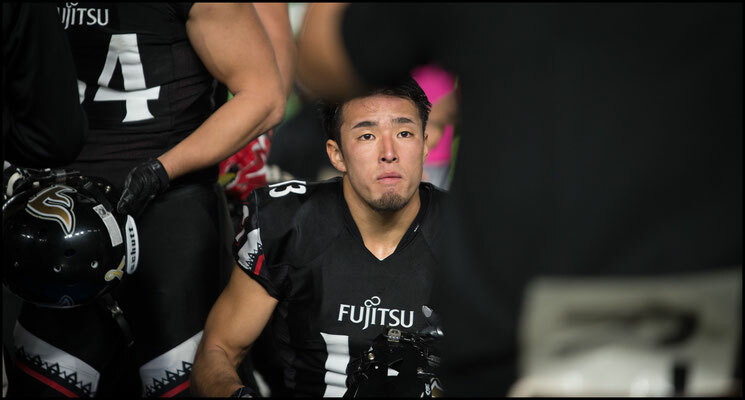 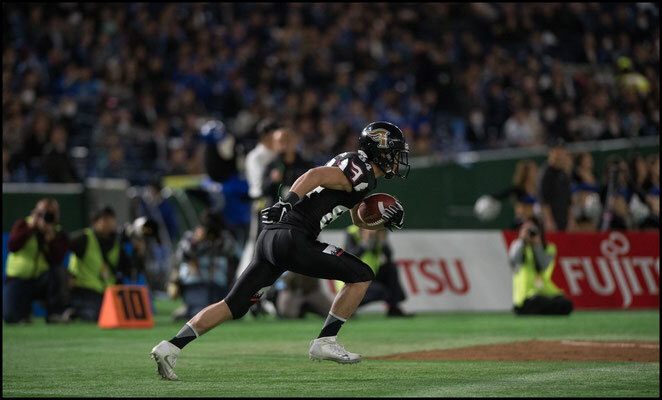 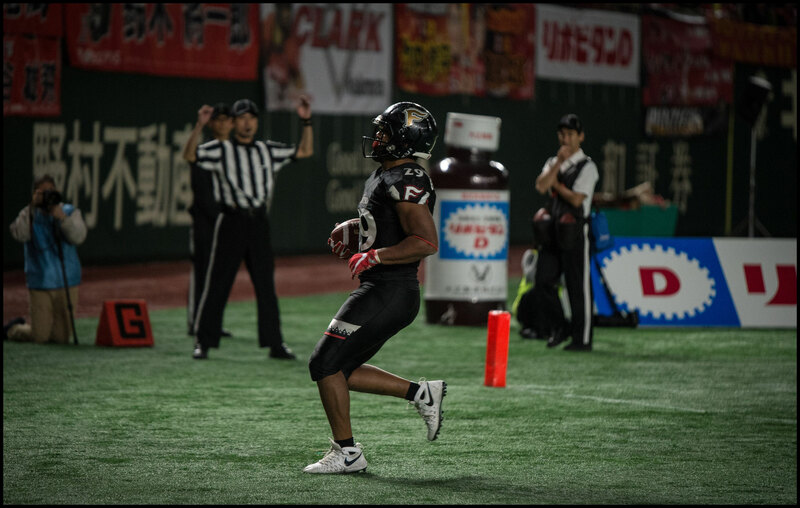 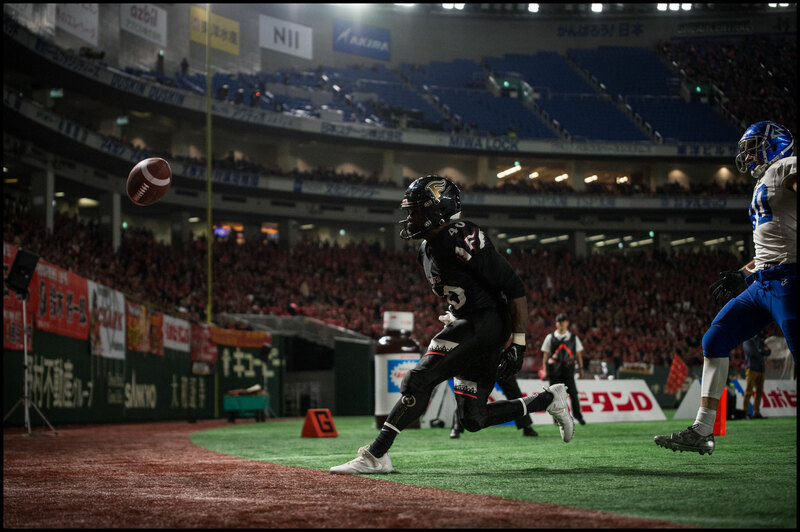 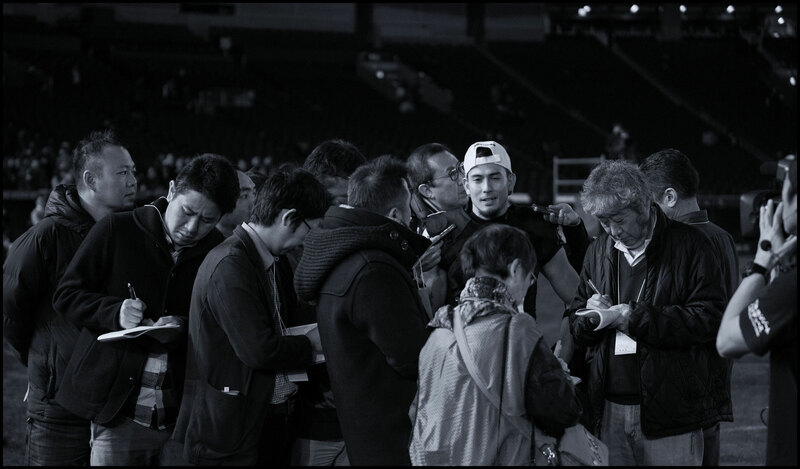 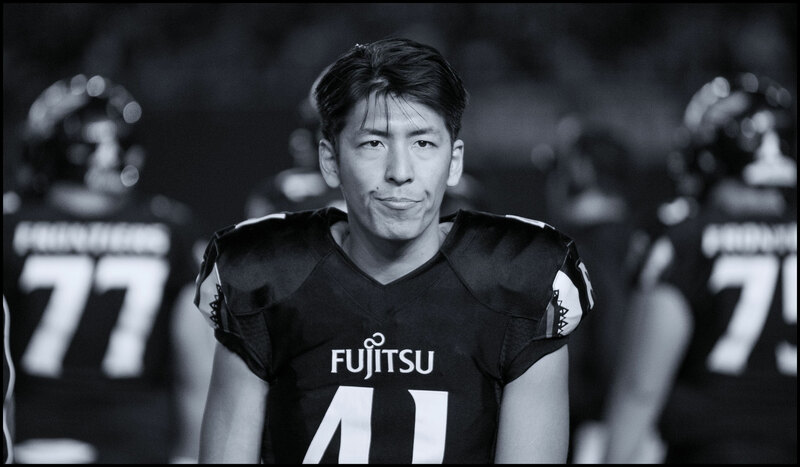 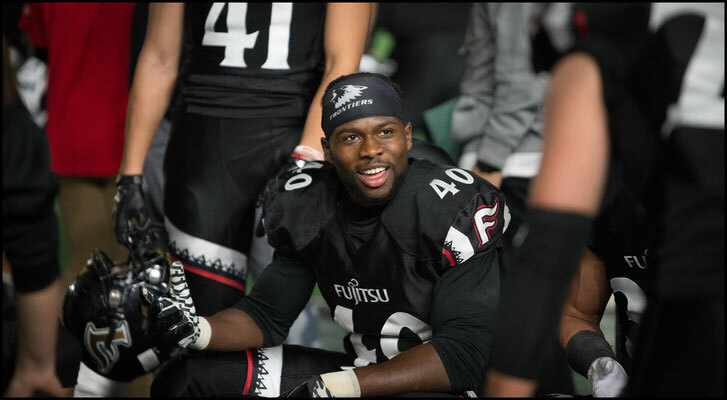 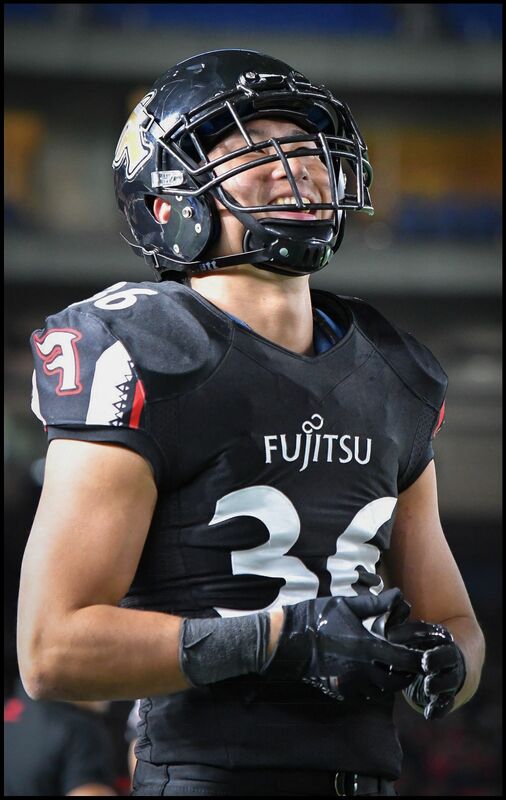 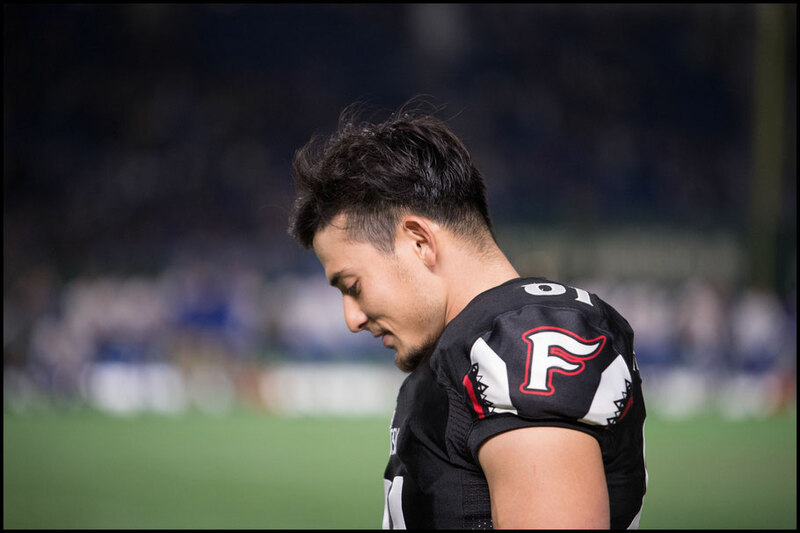 His 74 yard catch and run touchdown midway through the second quarter made the score 28 – 10 and even had Fujitsu not found the endzone again that would have been enough for the victory. 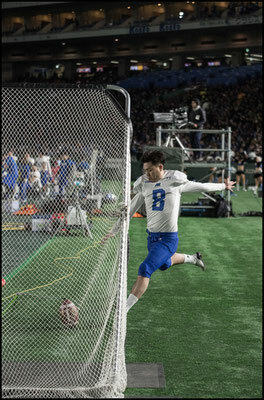 Find the endzone they did though. 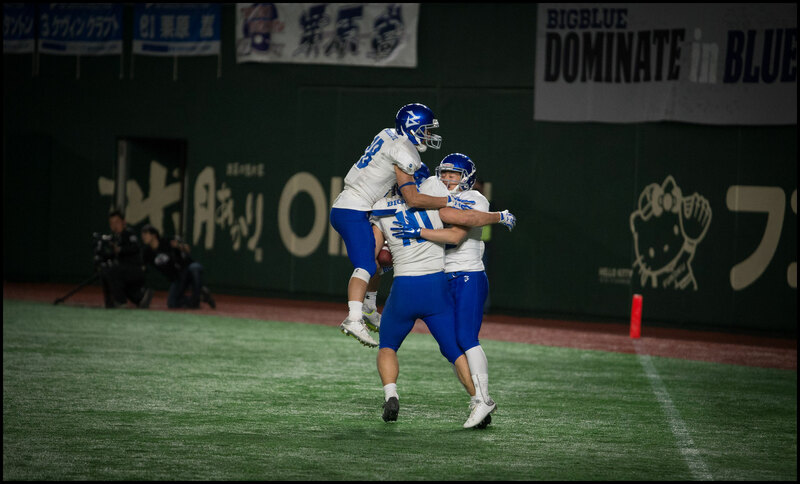 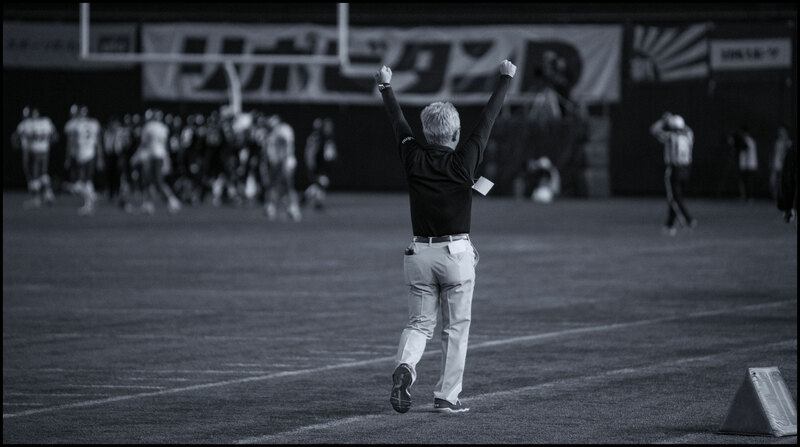 Nine times in total, for the highest score and biggest margin of victory in the JXB’s history. 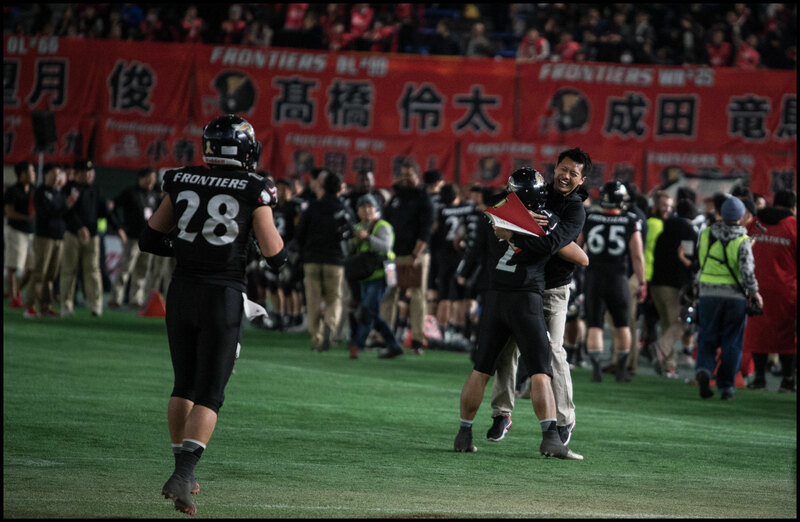 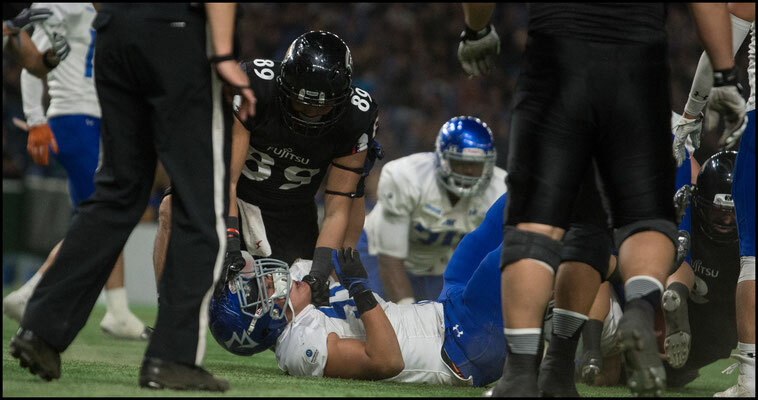 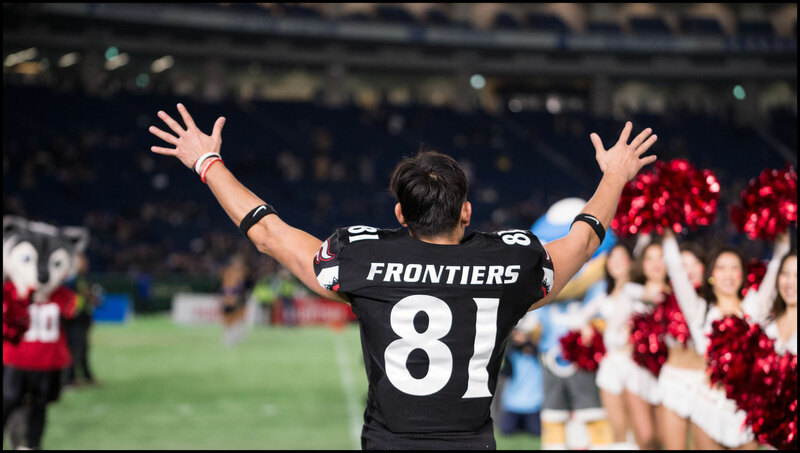 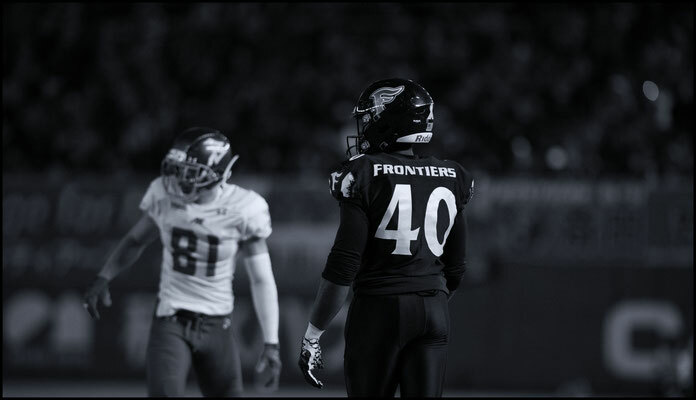 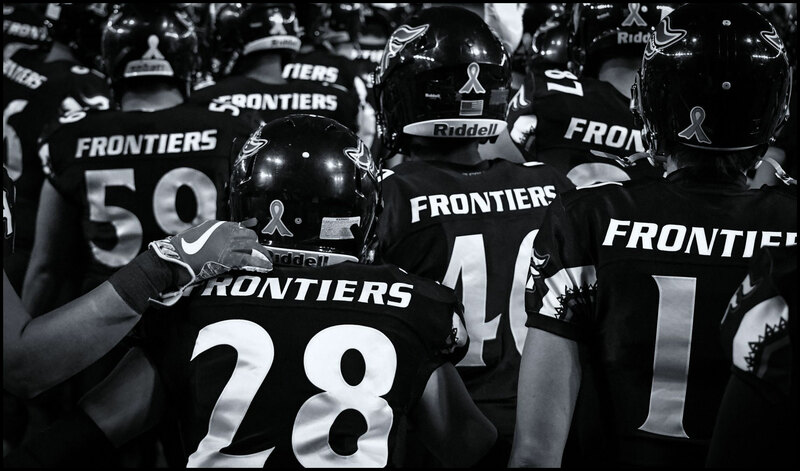 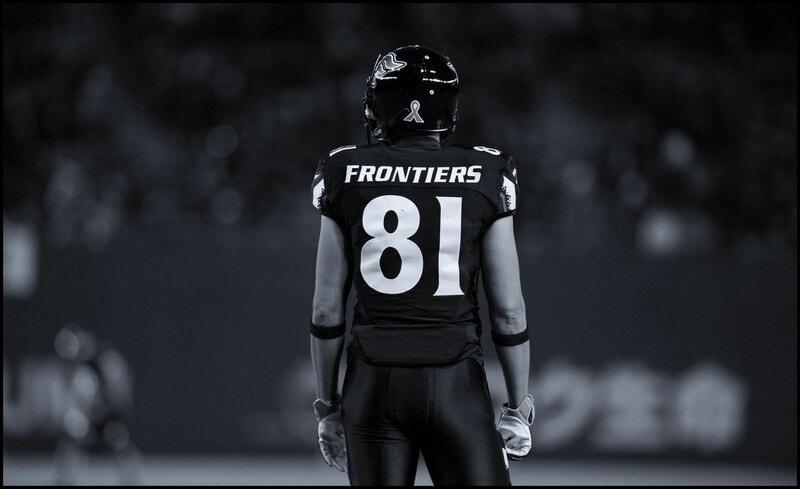 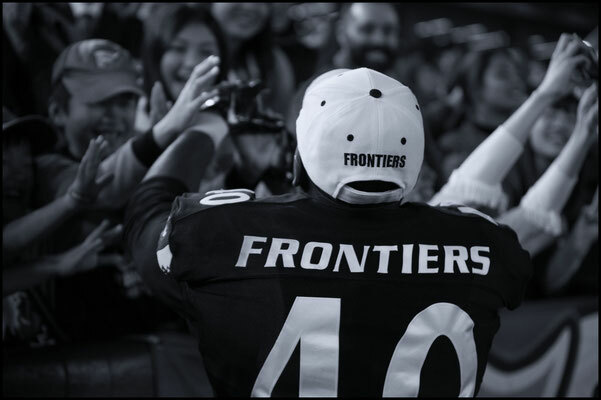 The win puts Frontiers back in the Rice Bowl on Jan 3rd where they will play Nakamura’s alma mater Nihon University Phoenix for the overall national championship. 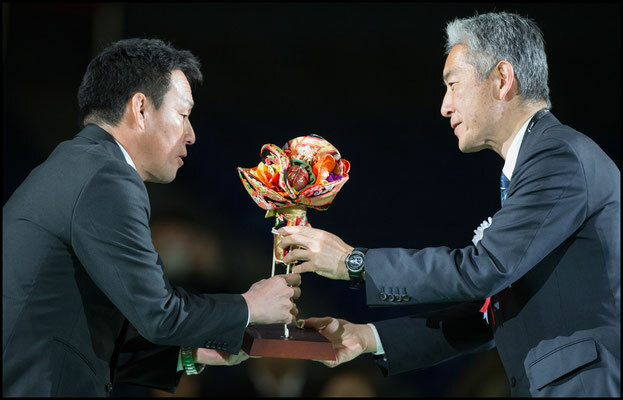 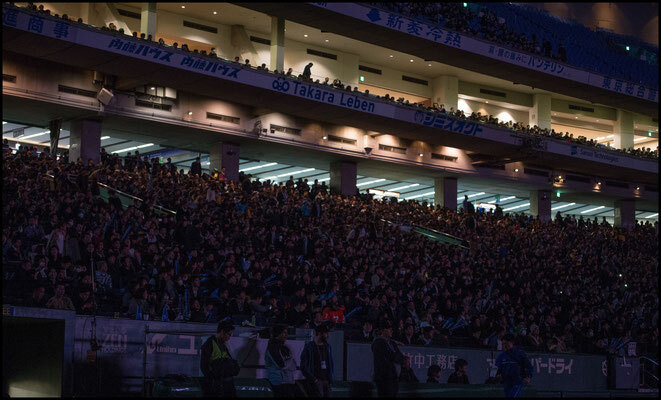 Nichidai as they are commonly known won the college championship for the first time in 27 years by defeating powerhouse Kwansei Gakuin Fighters 21-17 in Kansai’s historic Koshien Stadium the day before the JXB. 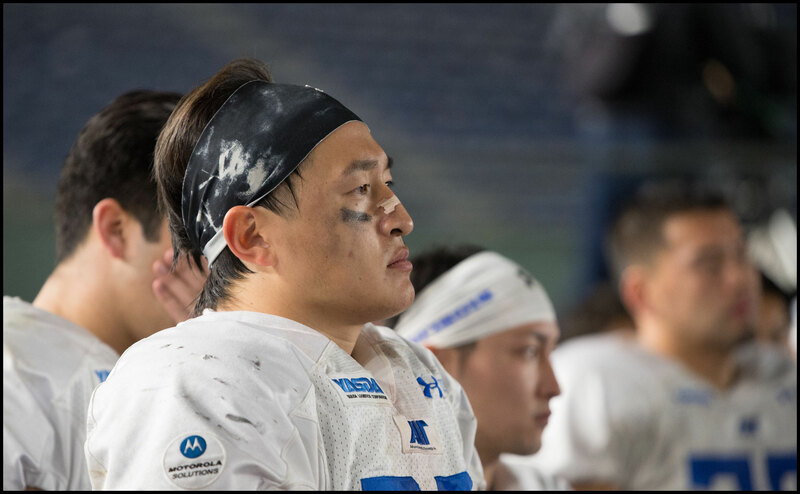 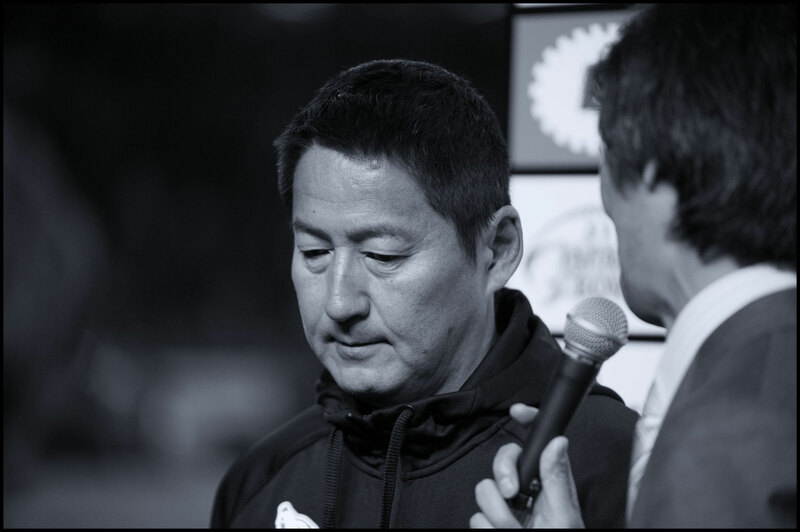 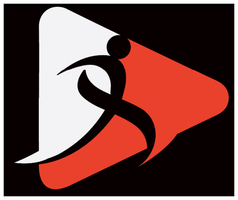 That 1989 – 1991 Nichidai team won three straight national championships, downing Renown Rovers, Asahi Beer Silver Star and Panasonic Impulse in the Rice Bowl. 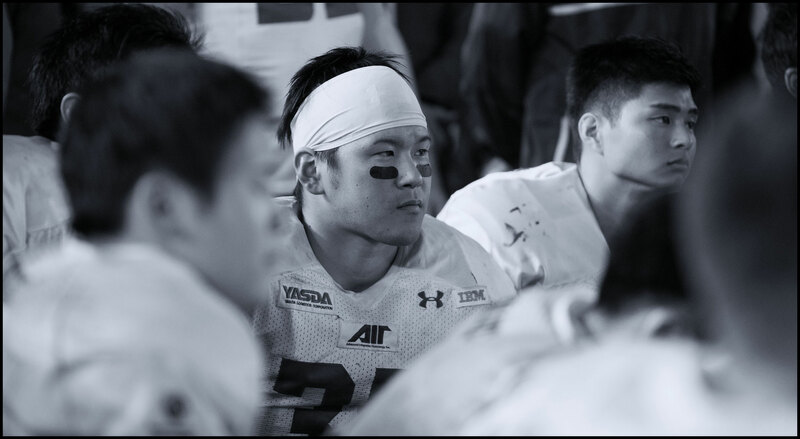 In the almost three decades since though, XLeague teams have won 21 times to the college side's five. 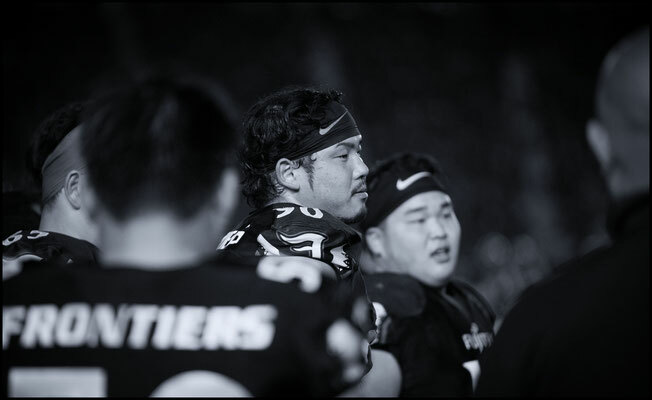 With Ritsumeikan Panthers nine years ago getting the last student victory, Phoenix will be huge underdogs next month. 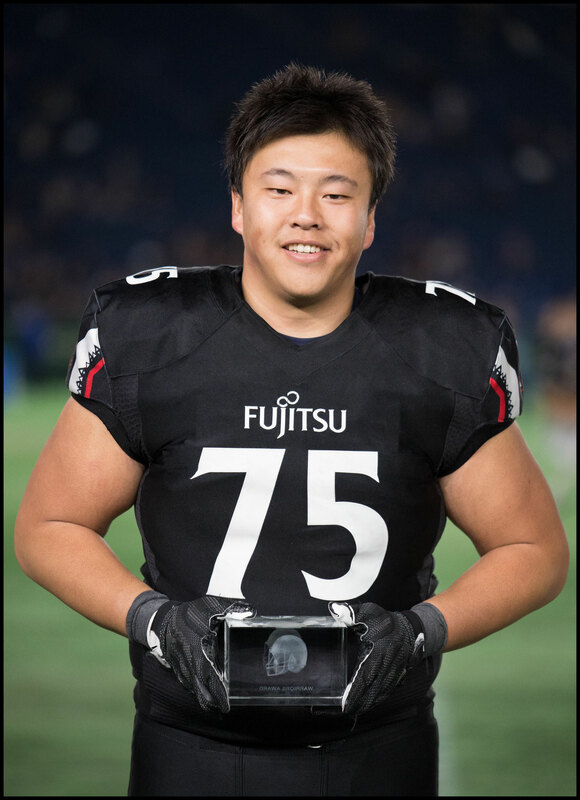 The student team will find it very difficult to handle Fujitsu’s road grading front line. 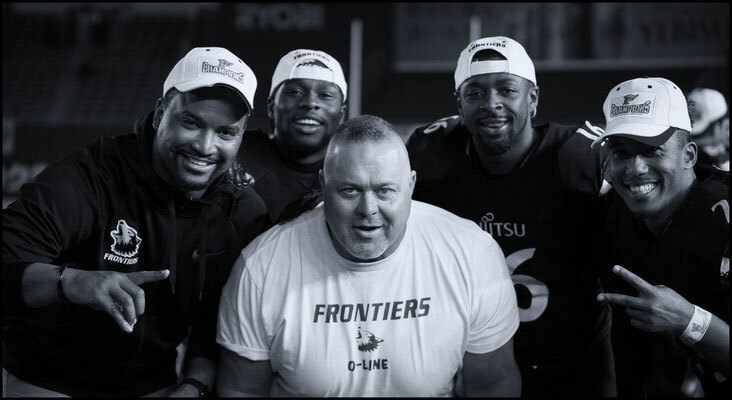 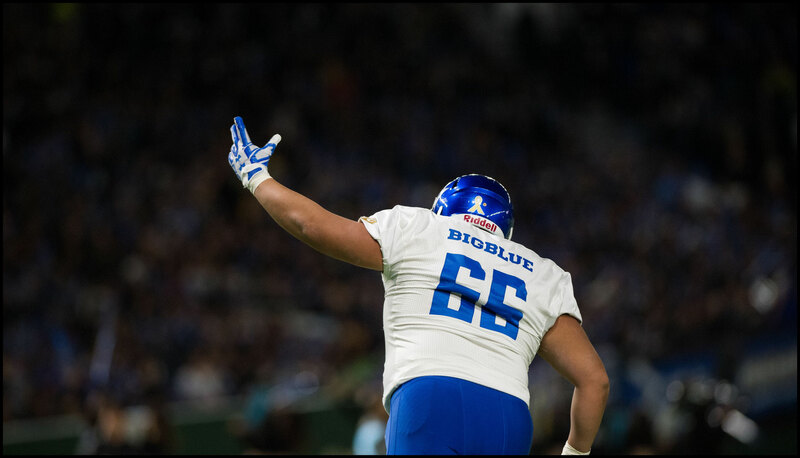 Despite losing Sun Mochizuki to a suspected broken ankle early in the JXB, Frontiers – using ten different players on the OLine - completely dominated Big Blue’s huge American DLine. 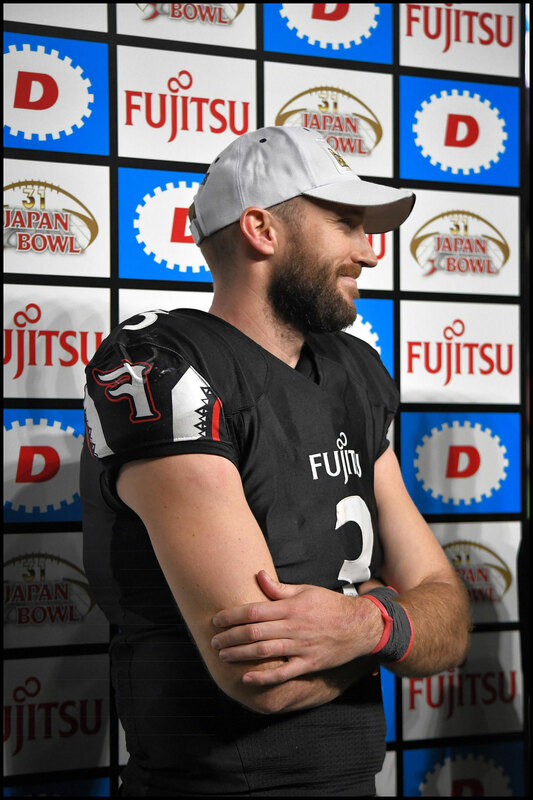 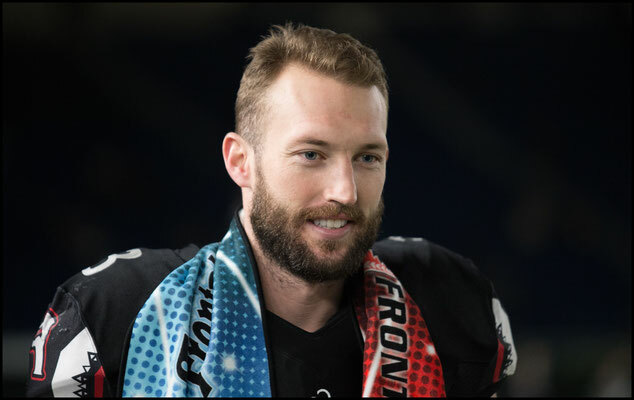 Given as much time as he needed play after play Colby Cameron found his targets all over the field completing 17 passes for 306 yards and four TDs. 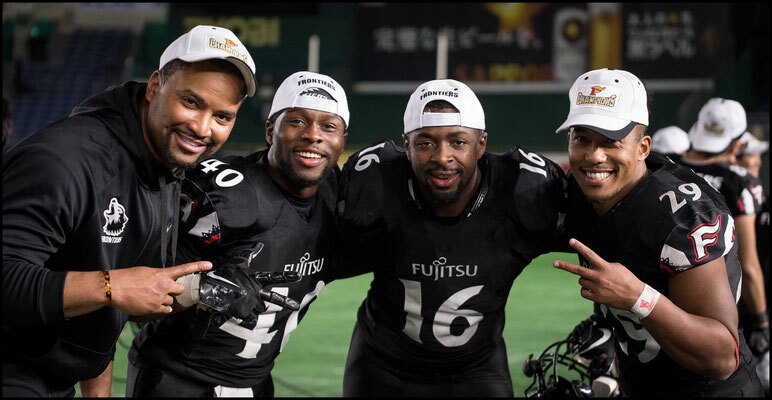 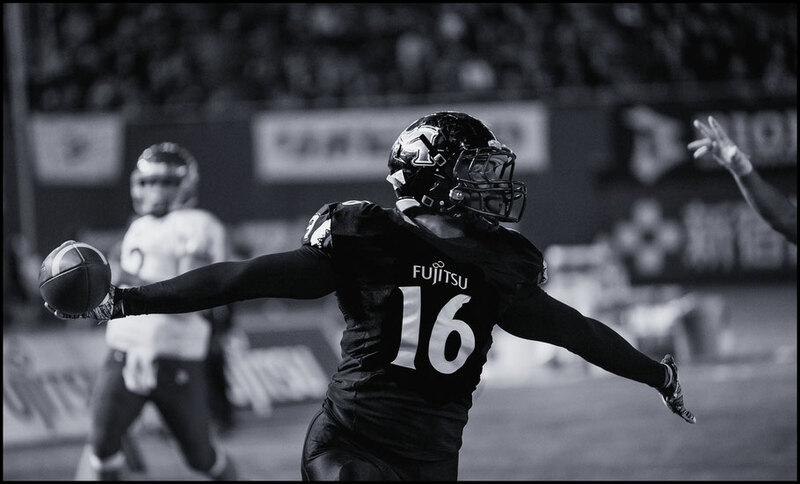 On the ground Fujitsu as a team had another 200 yards and three touchdowns. 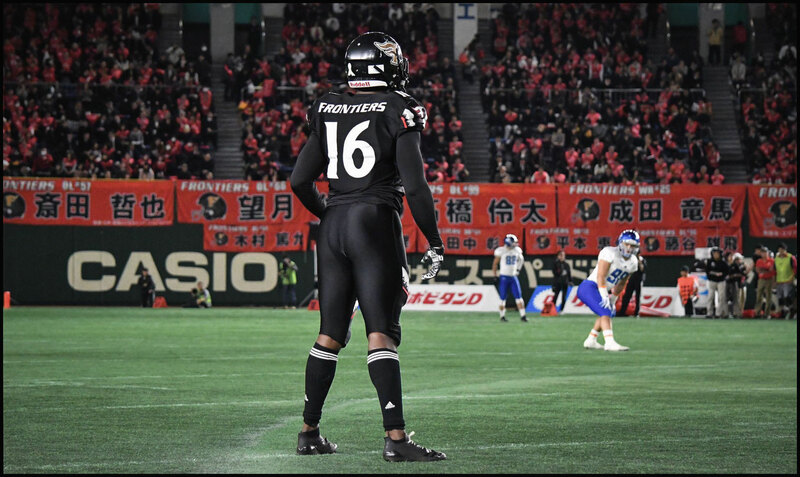 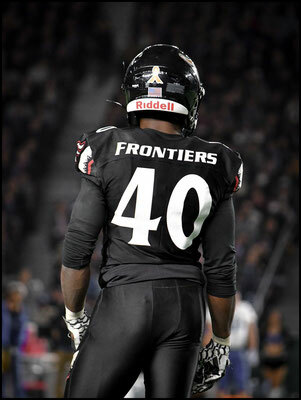 With the offense and special teams finding paydirt Frontiers defense wasn’t going to be left out and Trashaun Nixon returned an interception 60 yards for a score. 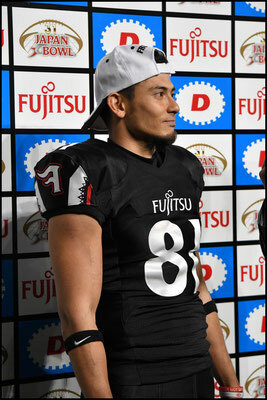 The 106kg LB showed some good moves on that record run. Despite being known for his pass rush skills, Nixon’s speed was utilized in coverage as well several times with him shadowing and blanketing some top class pass catches down field. 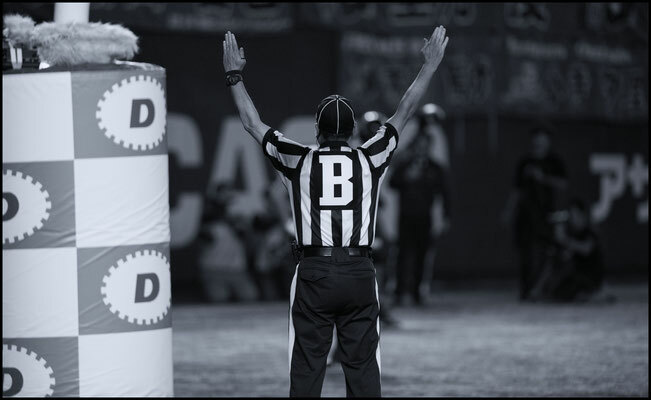 IBM scored early in the third quarter to make the it 35 -20 and give them some hope but the fact that three times they had to settle for field goals snuffed out any chance they had of matching Fujitsu’s scoring spree. 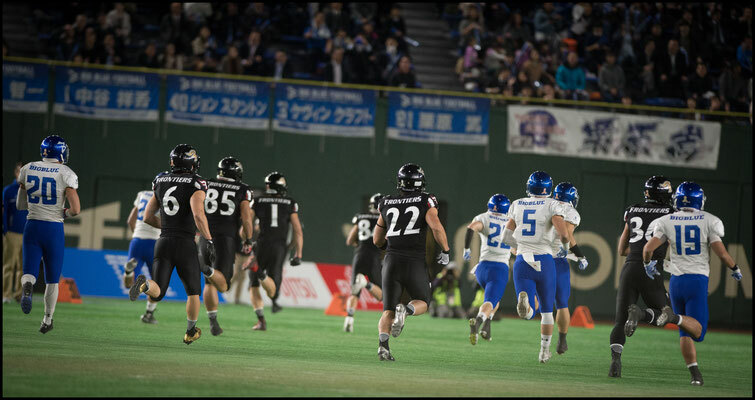 Wearing all black the Kawasaki based side kept their foot on the throttle all the way to the end. 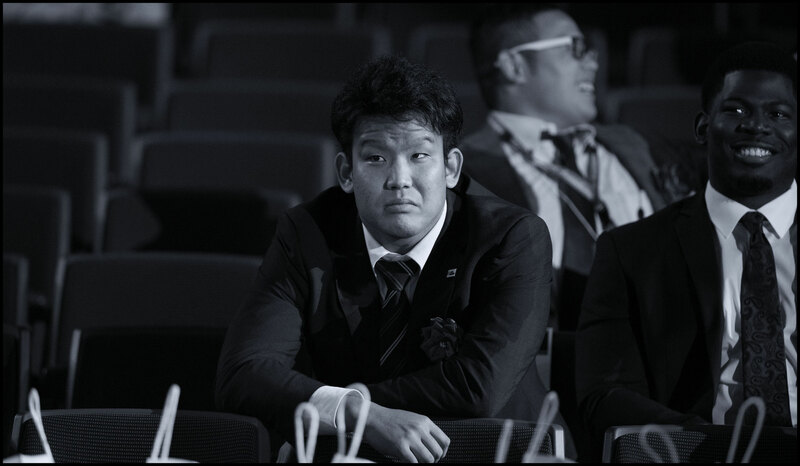 Big Blue players unsurprisingly seemed shell-shocked late in the game but it’s worth remembering that Fujitsu lost in their first five JXBs. 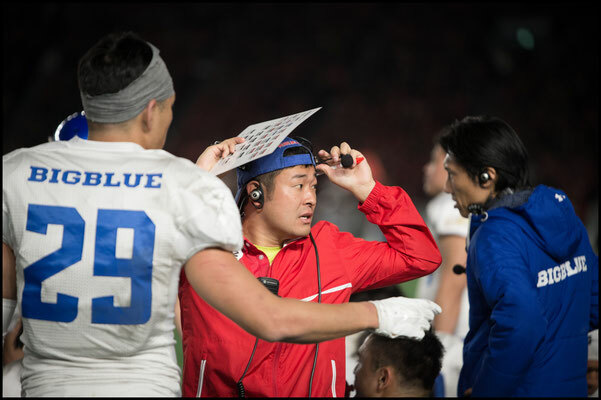 Those defeats between 2002 and 2013 spurred the team into bringing in American coaches and making the changes required to get them over the hump. Since their first win three years ago they have been the XLeague’s top side. 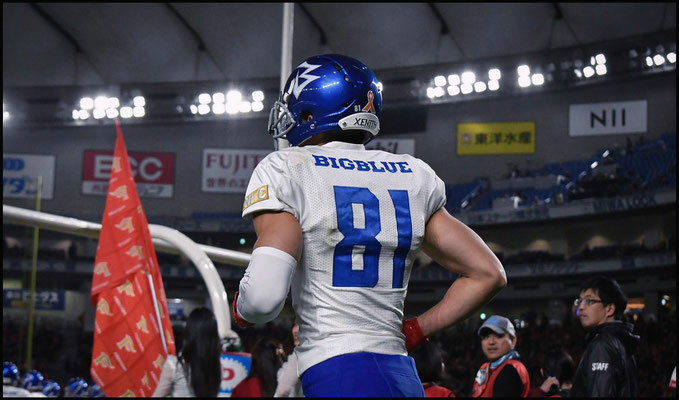 Big Blue in a way are like Fujitsu of five or ten years ago. 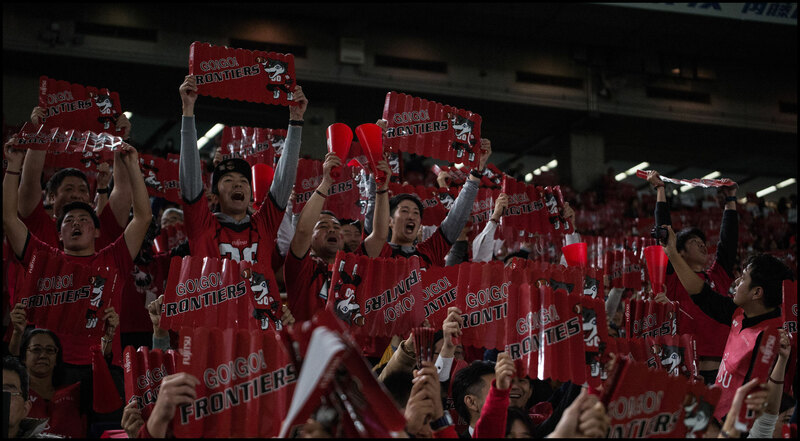 Despite the big defeat this time they are starting to close the gap and should be a threat again next season. 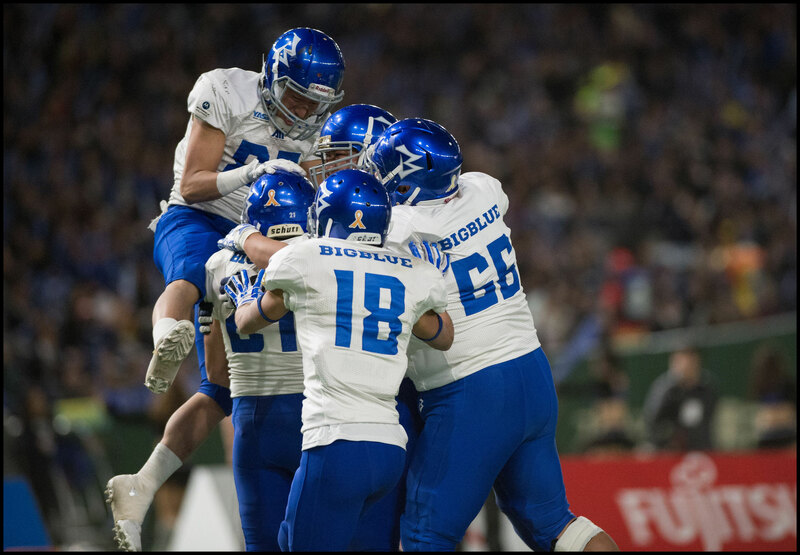 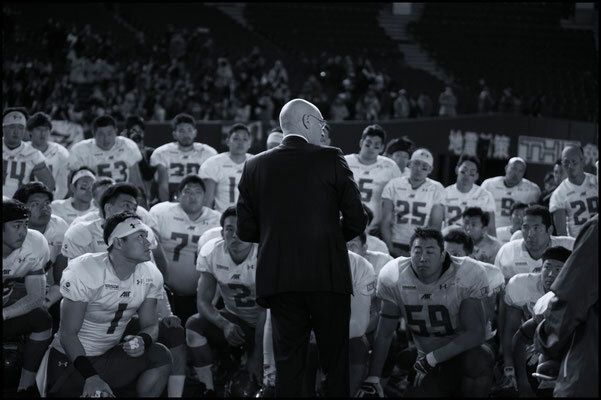 For a lot of the year IBM were the top ranked team and they did beat Obic for the first time ever and down an undefeated Panasonic side in the semifinals. Taking down all of the big three in one season proved a step too far but don’t be surprised if they are back again in the final next year. 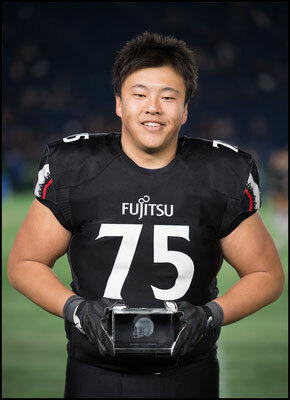 For now though it’s Fujitsu that are top dogs. 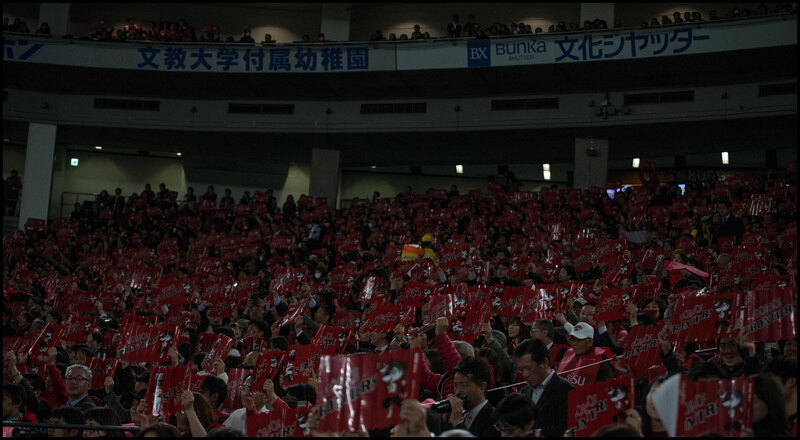 Given the way they approach the game they won’t celebrate much until the job is fully done though. 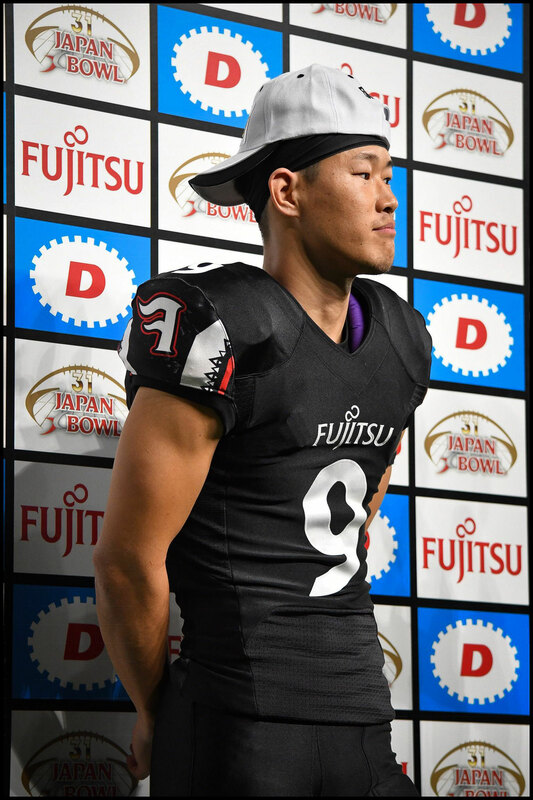 Despite the fact that Fujitsu will be overwhelming favorites in the Rice Bowl, Nichidai not having played on that stage in so long still makes it a fascinating matchup.